If you ever get the chance to visit Ireland, I hope you will go and visit the oldest city in Ireland, Waterford. 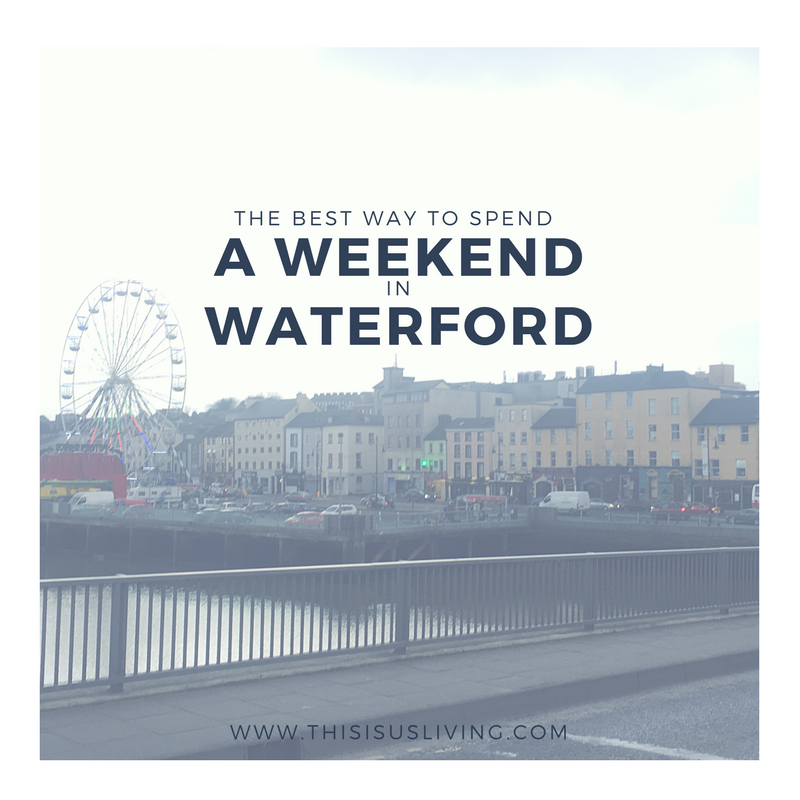 We decided what better place to visit over St Patrick’s Day long weekend than Waterford City. 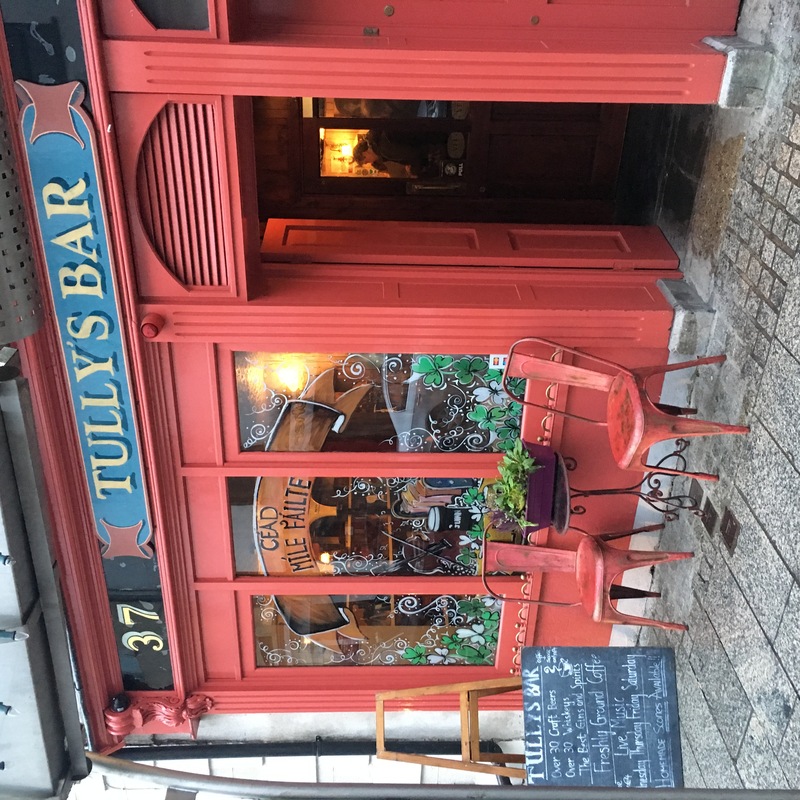 We were warned by locals that it is a lot less of a fuss than the annual parade that Dublin hosts on St Paddy’s but that is kind of what attracted us most to the trip – less crowds and more exploring a place that by all accounts is kind of underrated for some reason. By car; 2 hour drive. We decided to take the train, so we took the Luas red line, and got off at Heuston Station which is where the train leaves Dublin to go to Waterford City. 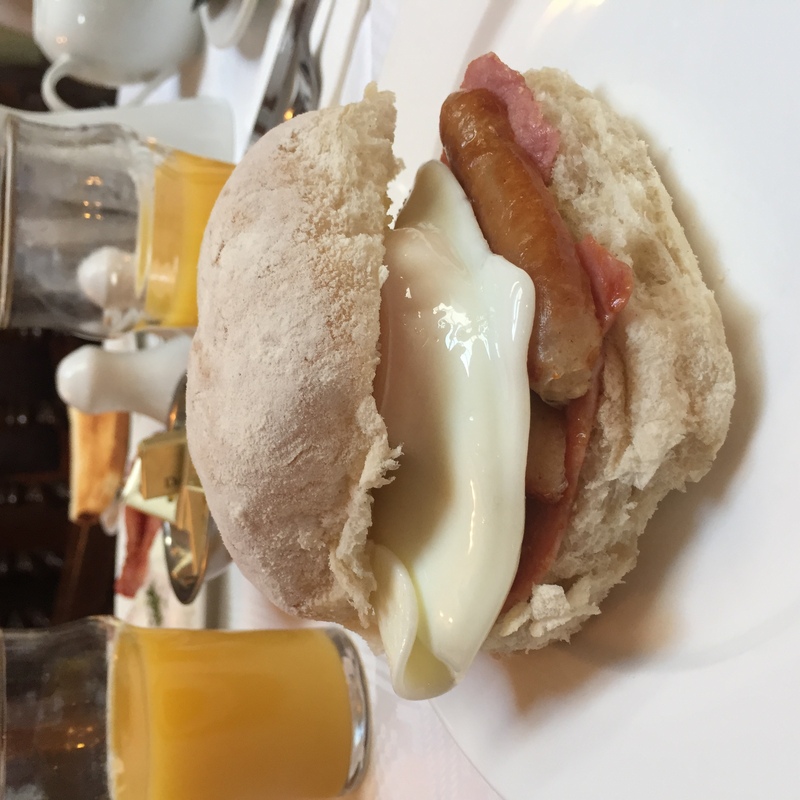 We stayed at The Barley Field, which was a short walk from town with very basic facilities but a pretty good breakfast included in the room fee. I think if you were wanting to spend loads of time at the hotel, it might not be great. The room was small, and there wasn’t much in the way of restaurants or places to eat. Depending on the night in the week, the pub gets a bit festive, but it quietens down after midnight. We were very happy to sleep there, get a good breakfast and hit the town to explore. 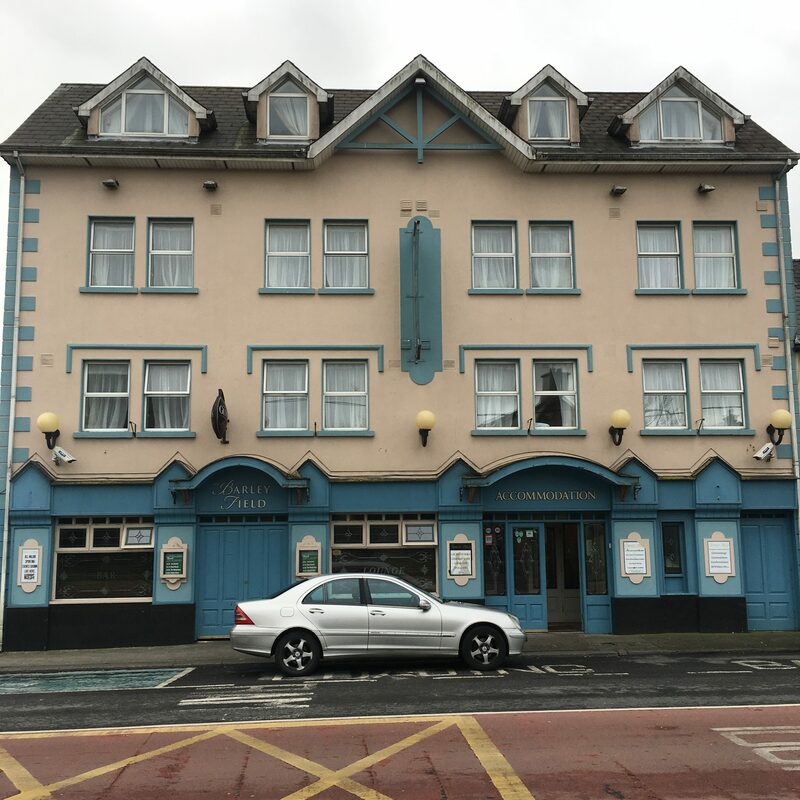 We didn’t eat out too much in Waterford, just to keep the budget down. 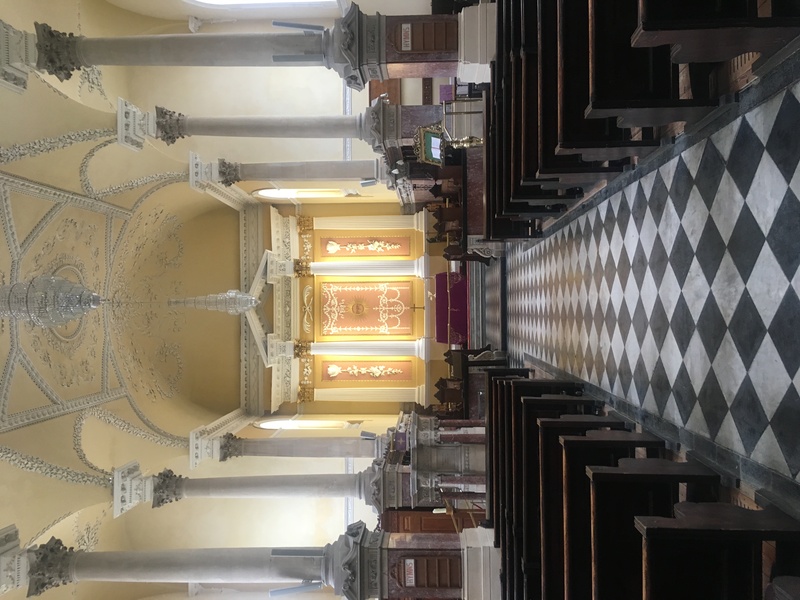 But we did find a few spots worth a mention, and definitely recommend you visit them if you are ever in Waterford for the weekend. 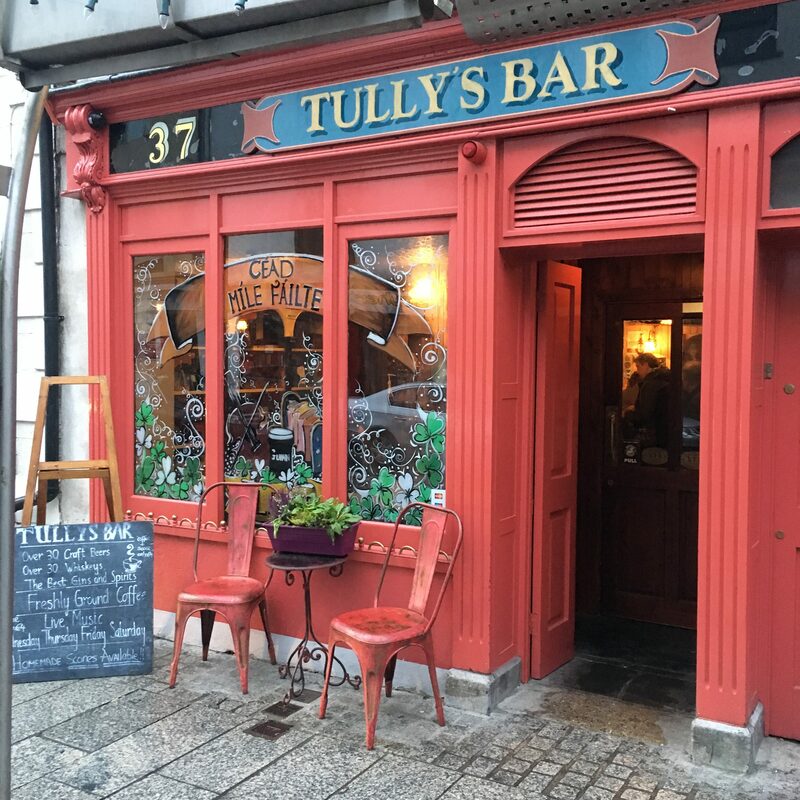 For a quick pint, and a bit of live music, definitely visit Tully’s Bar. They have a great selection of drinks, and it is a cosy pub with a small outside area in the back too. 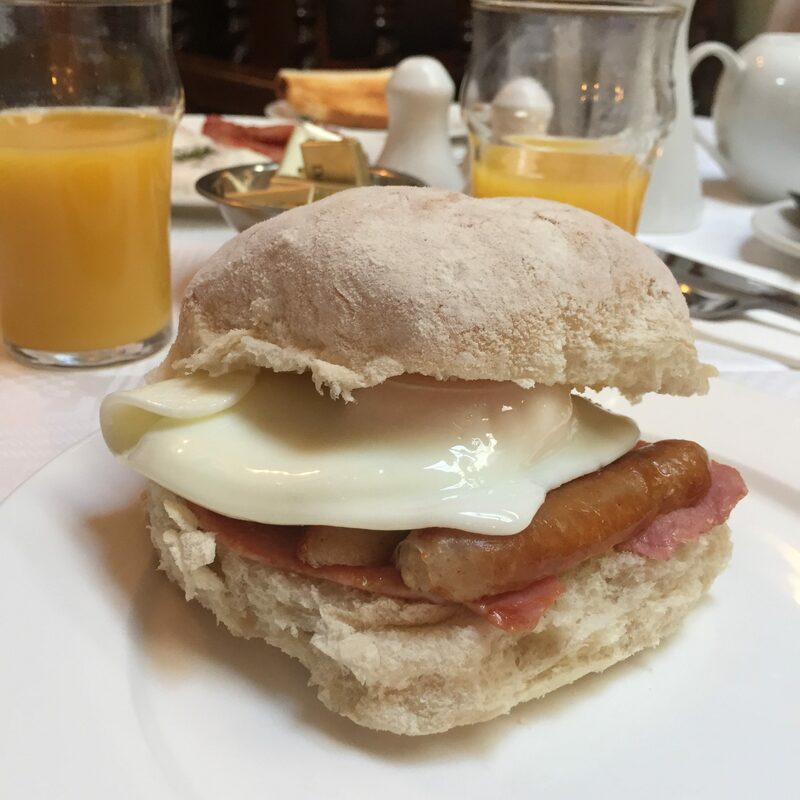 There are two meals, Waterford is “known” for, the one dates back to the 17th Century which is the Blaa. It looks like a floured roll but it is a lot more lighter and fluffier. They are best eaten fresh, as they dry out quite quickly. We had them for breakfast at the Barley Field. Not sure if they are worth all the hype but we at least ticked that off the old bucket list! Another food made famous in Waterford is at a place called Burzza. Basically they make really great burgers and pizzas. But if you are feeling adventurous, you should try their signature dish, namely the Burzza which is a burger wrapped in a pizza! 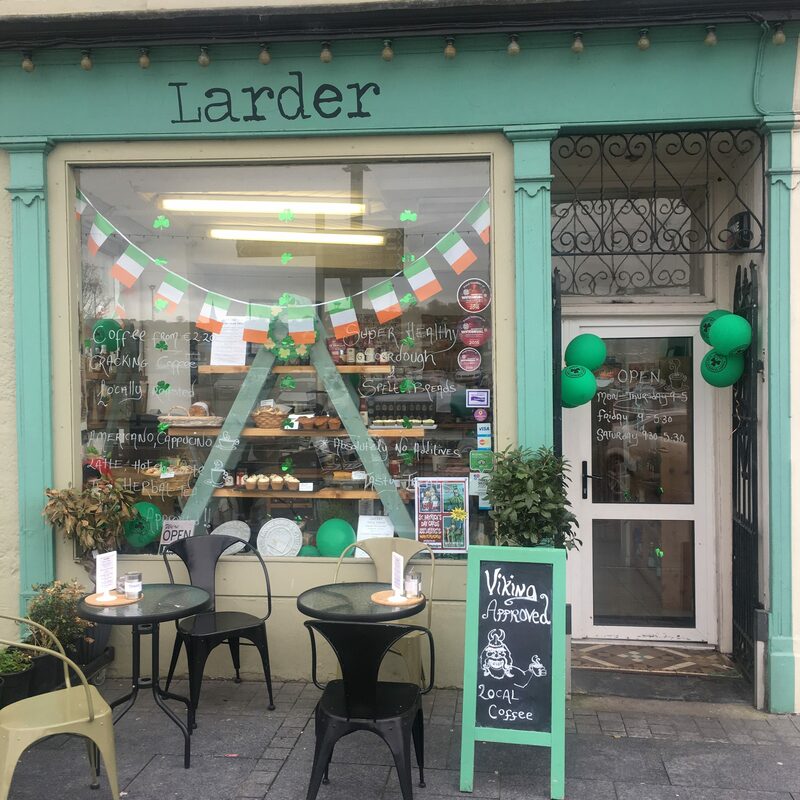 If you have a bit of a sweet tooth, then you need to visit Patrick Murphy at Larder. It is this great little coffee bar that sells viking approved coffee, plus great freshly made treats. We stopped in for a cupcake and a coffee. I have to say that Patrick was super friendly, and told us the story behind why his coffee is viking approved: One of the guys who plays in the TV show, Vikings, actually regularly goes in for a cuppa! Regardless of the story, I can honestly say, it was the best cup of coffee we had all weekend! 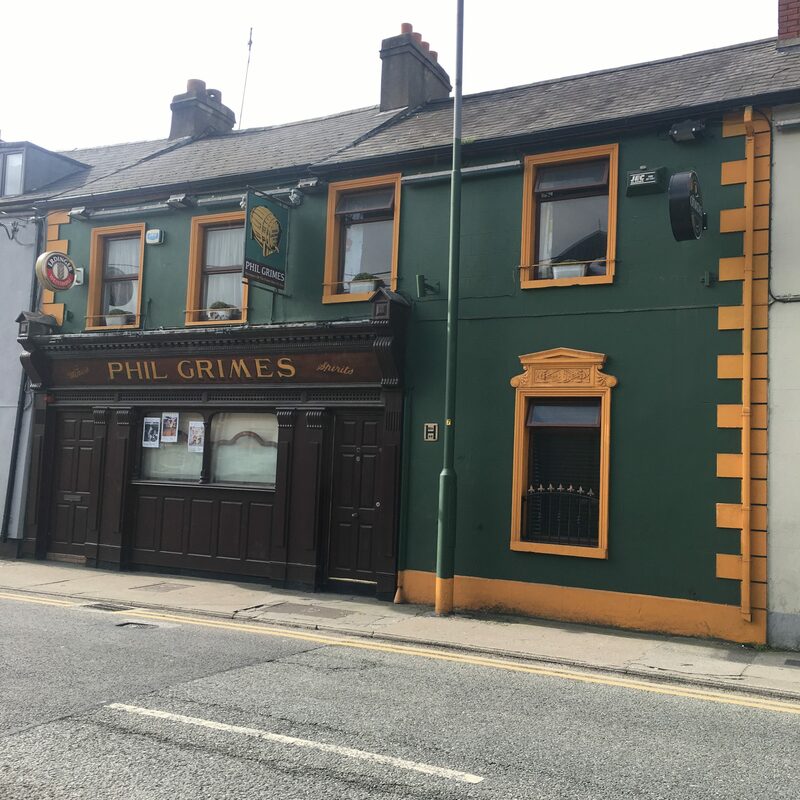 Then no post about our weekend in Waterford would be complete without me telling the story of our visit to the local pub called Phil Grimes. We stopped in here on the Friday we arrived, as a final pitstop before bed. We walked in and found the pub was seemingly quiet for 9pm on a Friday eve but regardless, we thought we would sit at the bar and have a quick pint before heading back to our room. It wasn’t long before the bartender asked us where we were from, and what we were doing in Waterford. Within a few minutes Tom, the bartender/owner, started listing all the things we needed to see outside of Waterford. What we realised is that there are some really cool spots to see out of town, but all unfortunately most require a car to get to. Especially because on weekends the bus services don’t run regularly to these out-skirting towns. At the end of our drink, Tom offered to take us out to Dunmore East, a seaside town about 20 minutes drive out of town! We stayed for another drink and chatted with the rest of the locals. 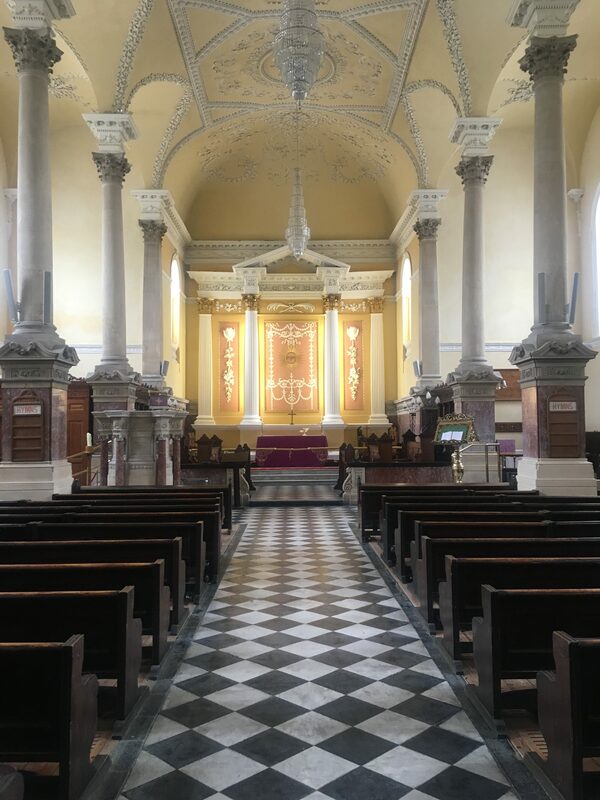 I have to say that it was the first time since arriving in Ireland that I felt so welcome, and honestly, they were so proud of their home – they were all such great tour guides. 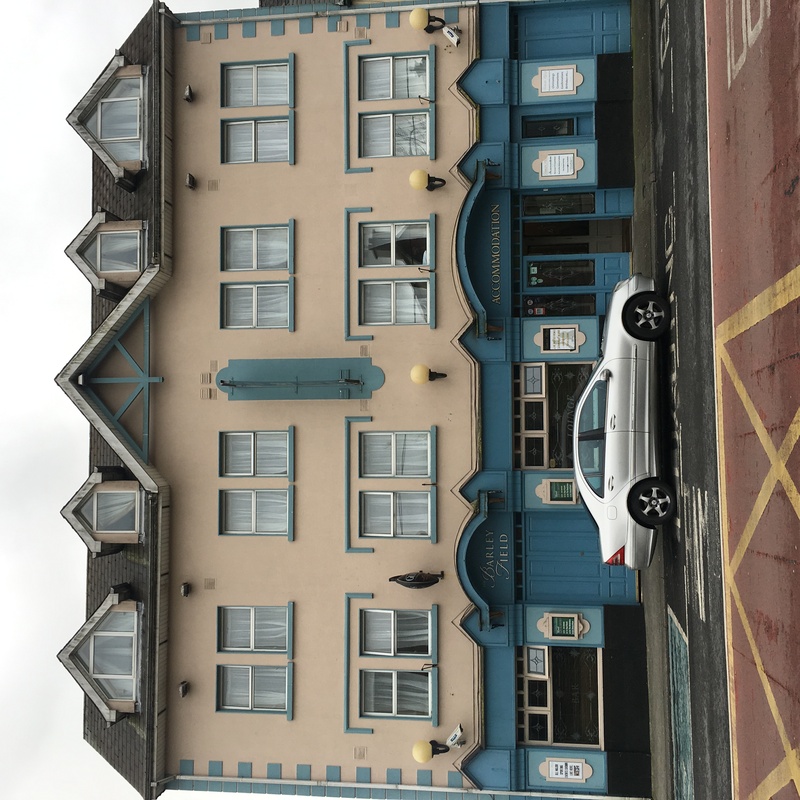 We took Tom up on his offer to drive us to Dunmore East and the visit to this local pub even prompted us to visit Dungarvan the next day – but I will have to talk more about these two towns in another post! 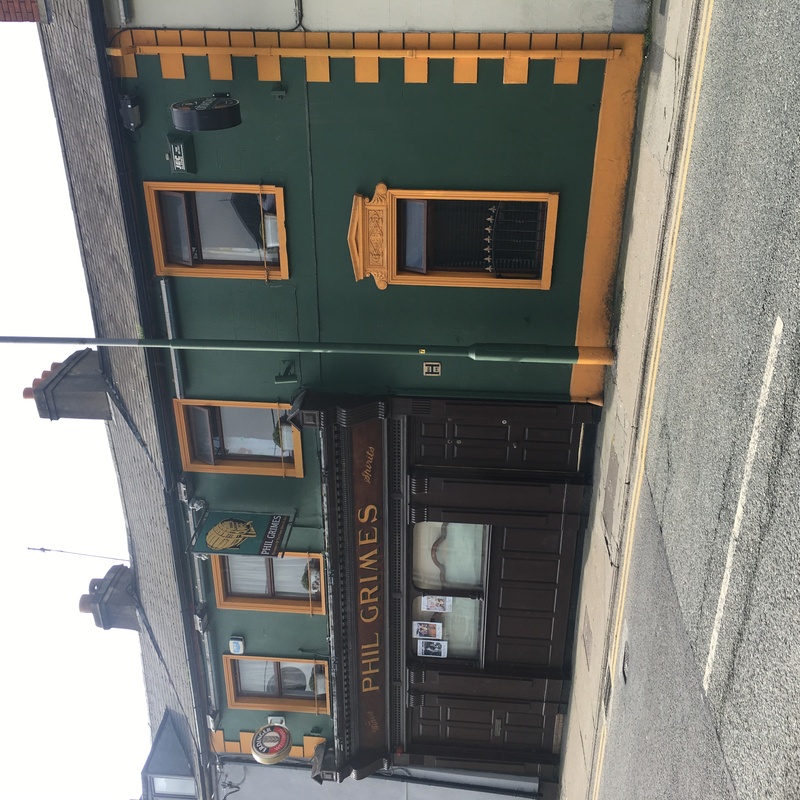 If you want to get a sense of a local Irish pub, with real locals that are friendly and welcoming if you sit quietly and are ready to chat – then this pub is a must visit! Tom, we thank you for your kindness and hope one day to go back and visit you at the pub. 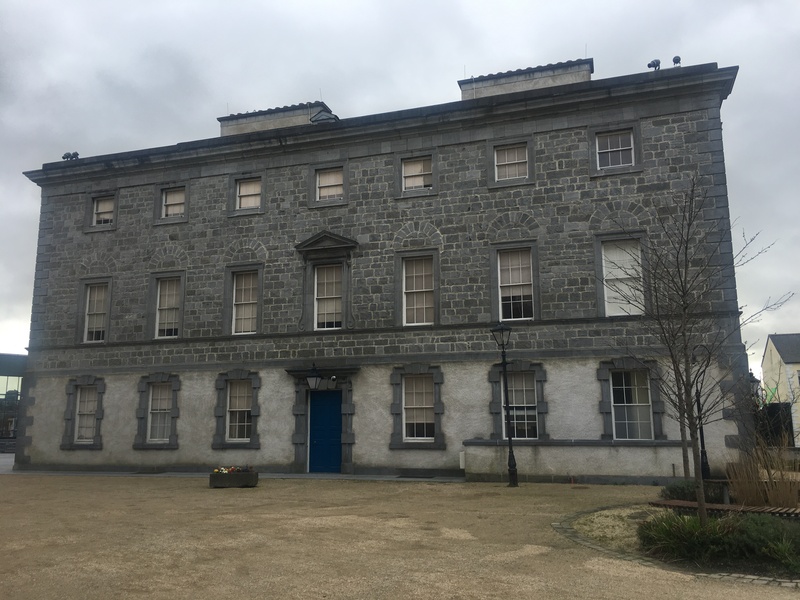 Admittedly we were on a bit of a tight budget so we skipped out on going inside a lot of the museums and tours Waterford had to offer. 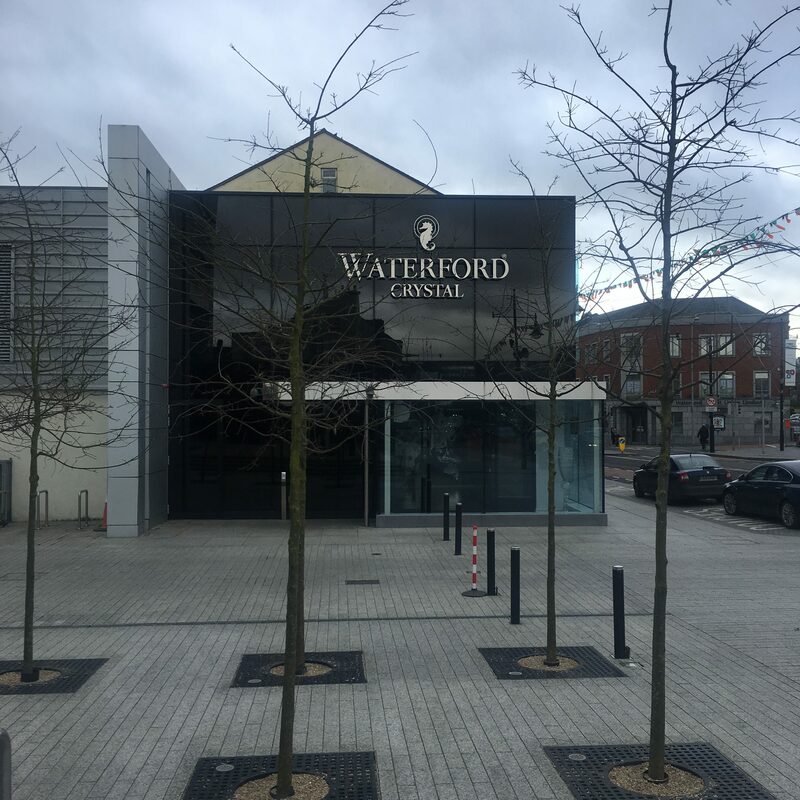 However, Waterford is fairly easy to walk around and really, walking gives you a better feel for the place versus zipping through in a car. We found a lot of street art on the walls, as well as walking through parts of town where the medieval defensive towers and walls are still in tact. These walls once divided the town up between vikings and anglo-normans. The history of the town dates back to when vikings first founded the town in 914 A.D. 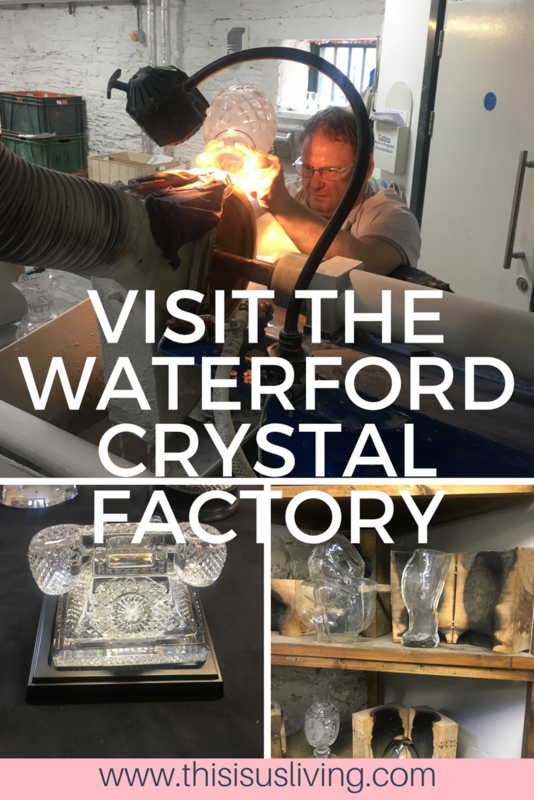 The one place we knew we needed to visit was Waterford Crystal Factory. 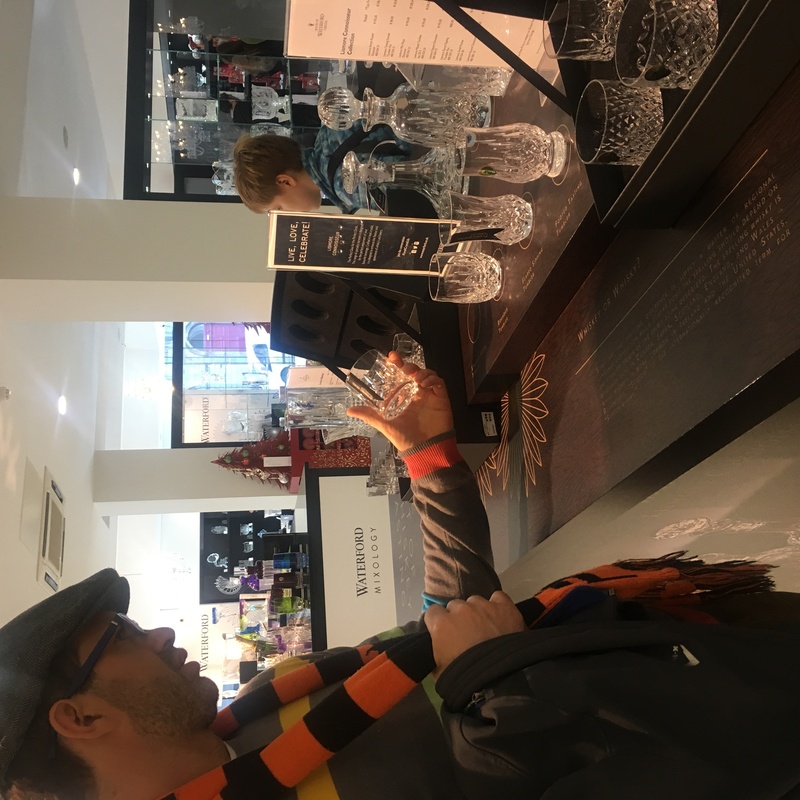 It was quite a pricey entrance fee of EUR13.50 each but I have to say, the tour through the factory and watching how crystal is made and crafted definitely makes up for it. I took a million video clips and pictures throughout the tour, and I have to say, I would probably be happy to go back there again. I know Rob’s mum is really keen to visit, so we would love to take them down there! 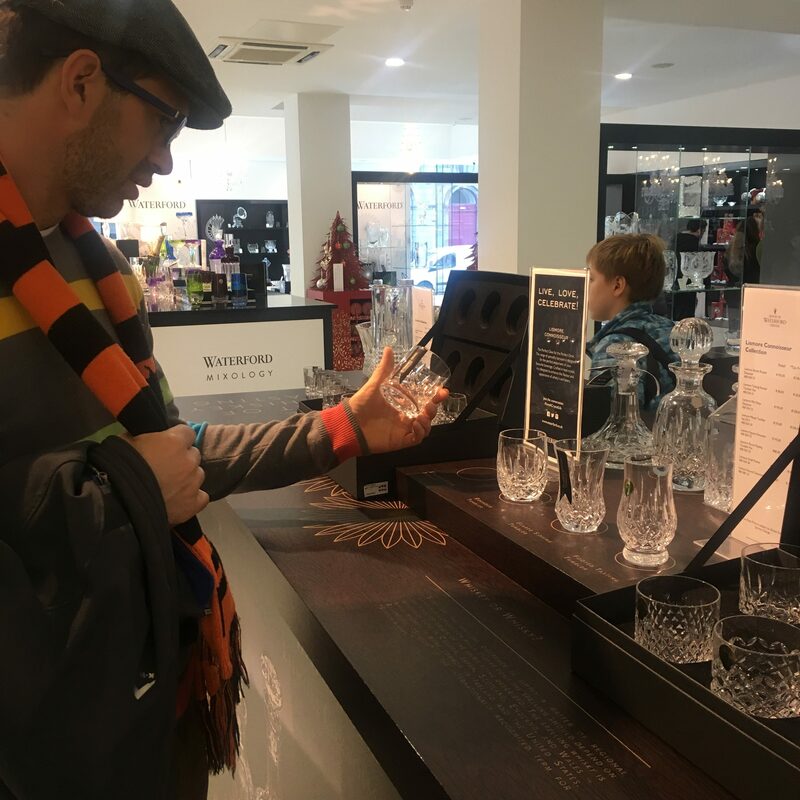 Rob of course had no issue picking up pieces of crystal in the showroom – I on the other hand was freaking out that he would drop something and we would be liable to pay for it! 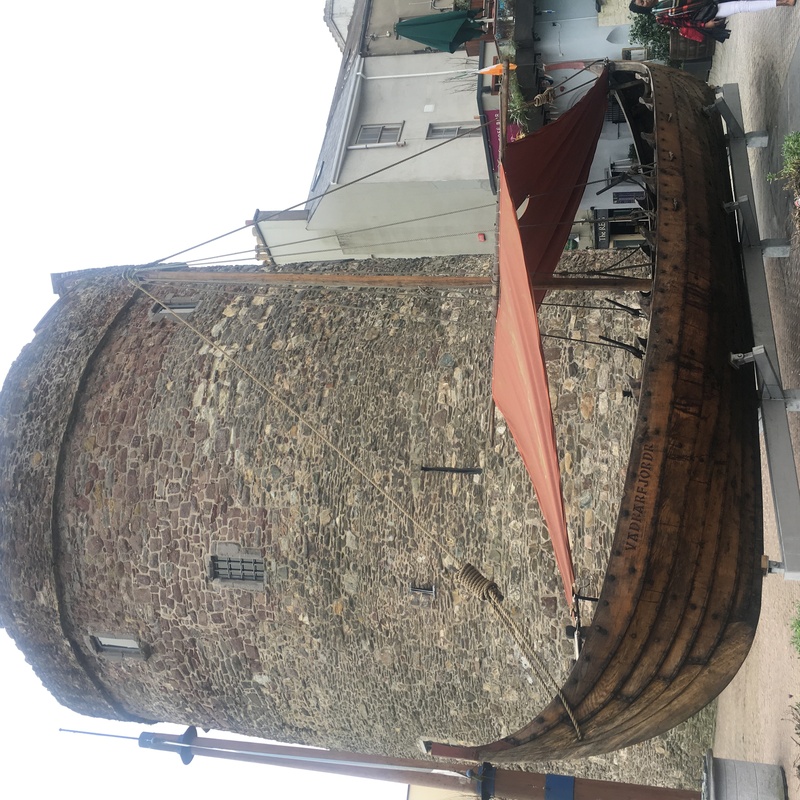 The Waterford Treasures are three museums in the Viking Triangle, namely: Bishop’s Palace, Medieval Museum and Reginald’s Tower. You can visit all three for a combo price deal. Reginald’s Tower is the oldest urban civic building in Ireland. 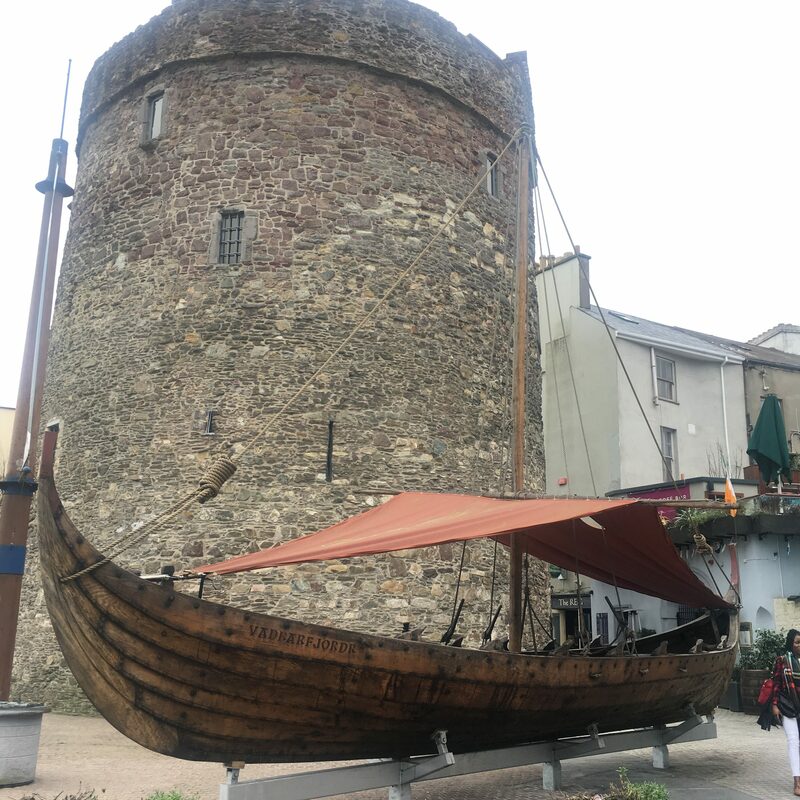 It also has an replica viking long boat outside of the tower. 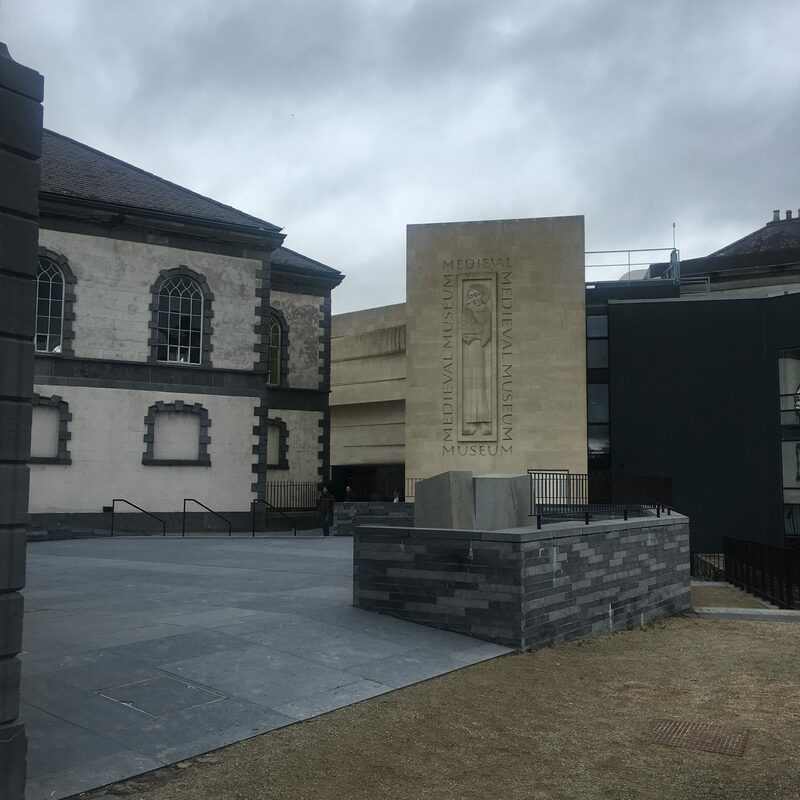 The Medieval Museum is said to be the only medieval museum in Ireland, this is according to all the online research we did leading up to this visit. 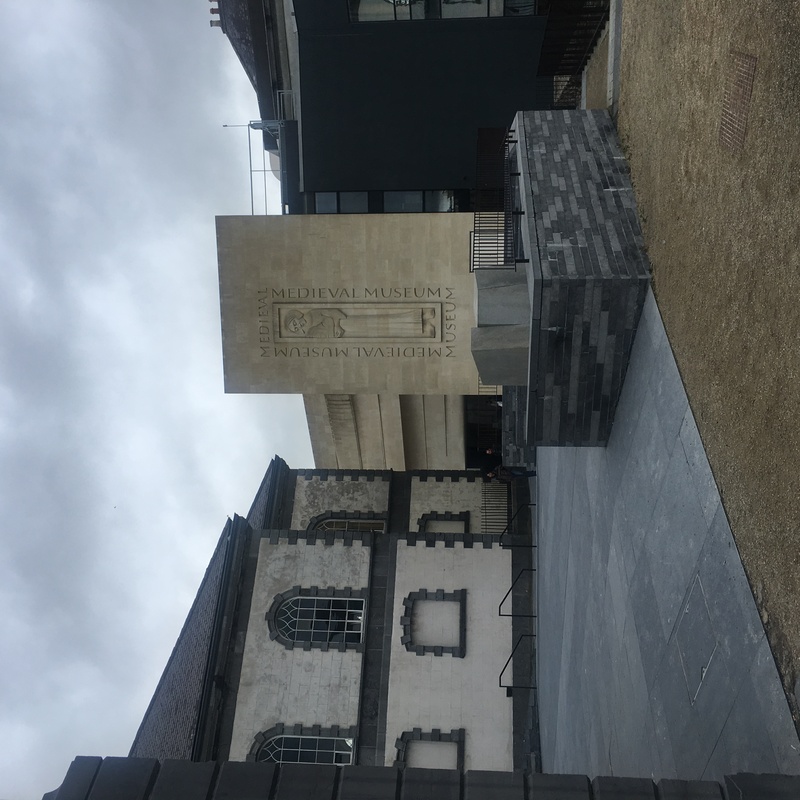 But I would argue that that is not really true since we visited Dublinia in Dublin and the Athlone Castle – both of which are medieval museums as well?! Perhaps I am missing something here? Bishop’s Palace is a Georgian mansion which covers Waterford’s history from 1700 to 1970. It also has the world’s oldest surviving piece of Waterford crystal, a decanter dating from 1789. We walked around the grounds, but decided not to pay for the tour inside. In hindsight, had we had more time, I think the combo for all three spots would have been 13 euro, so actually not too bad in price. Christ Church Cathedral is free to visit. I am not sure what it is about churches that has me so captivated. We are not particularly religious, I think it is the fact that there is so much history within the walls that makes them so intriguing to me. The detail on the ceiling was so dainty and beautiful. I also have to say that I may start a collage of street art at the end of every post because this is by far my fave thing to find in every city we visit. 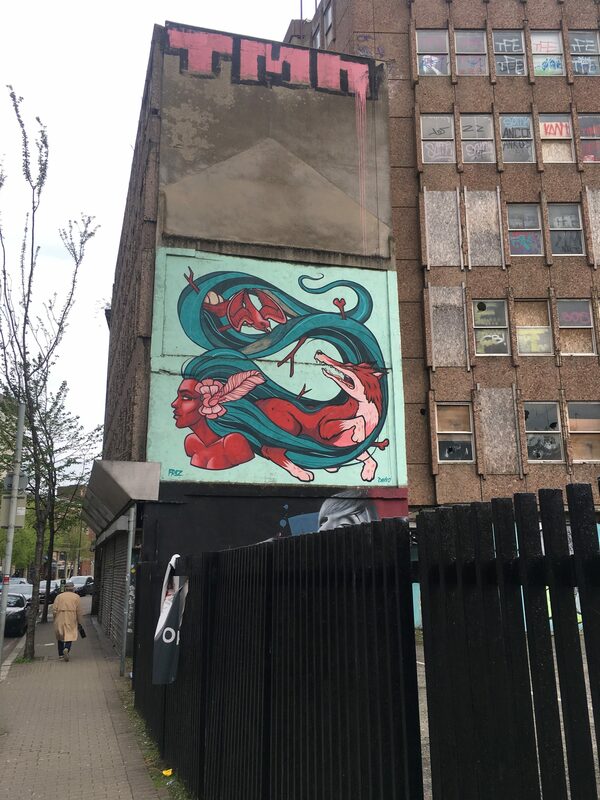 It is such a great reason to walk through your own city too, you can find street art almost every corner you turn. Plus it is totally free to look at and admire! 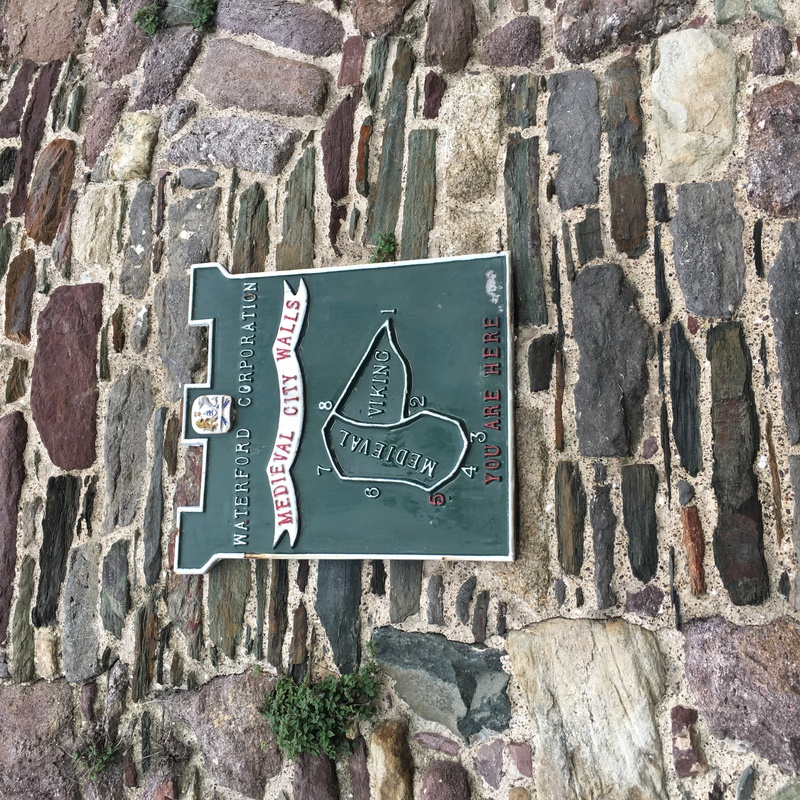 We did all of this exploring of Waterford City on Friday and some of Saturday. After lunch on Saturday we took a bus out to Dungarvan for the rest of the day, and for the whole of Sunday we explored Dunmore East. 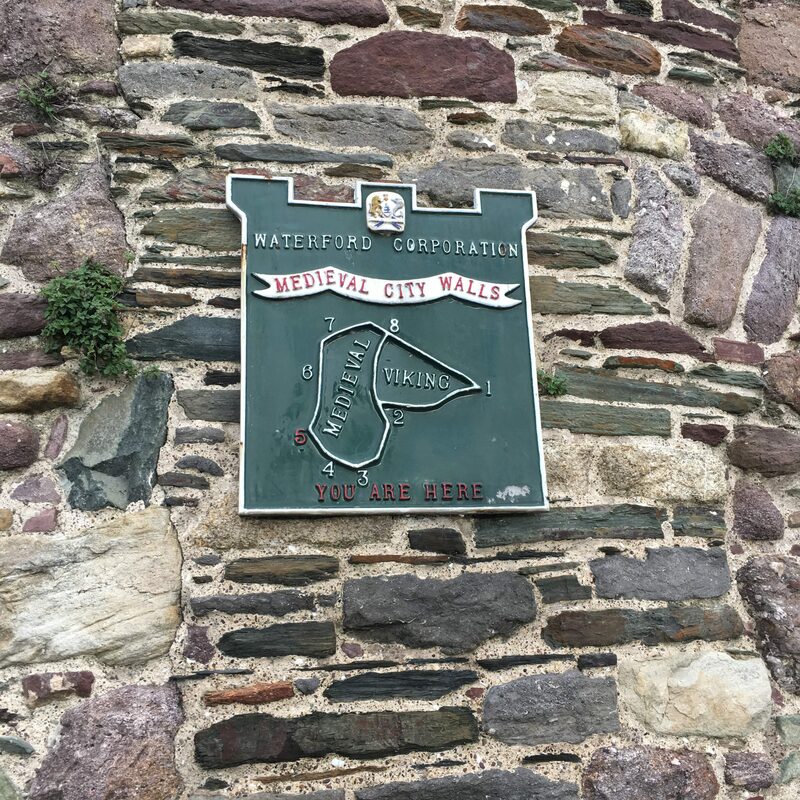 If that is one thing I have to say, it is that if you plan on staying a while in Waterford, then you definitely need to rent a car because there is so much more to see in the whole county of Waterford. 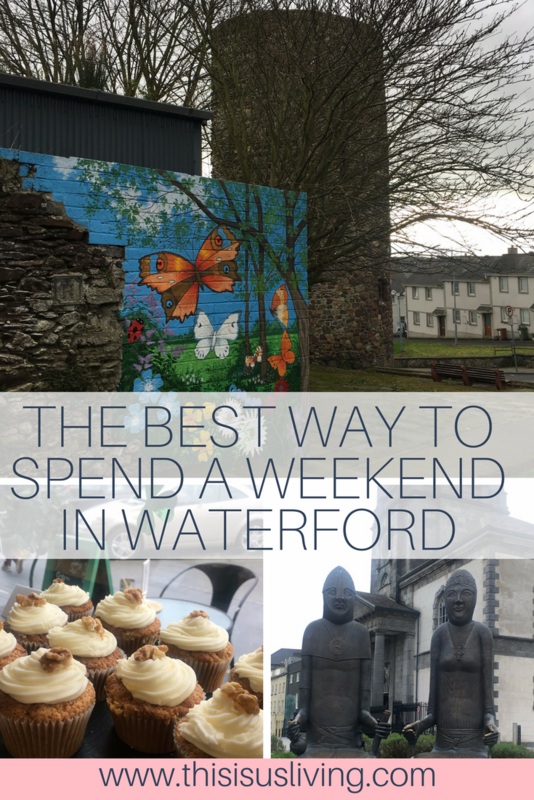 But if you plan to break it up into shorter visits, then Waterford city itself is perfect to explore over a weekend. 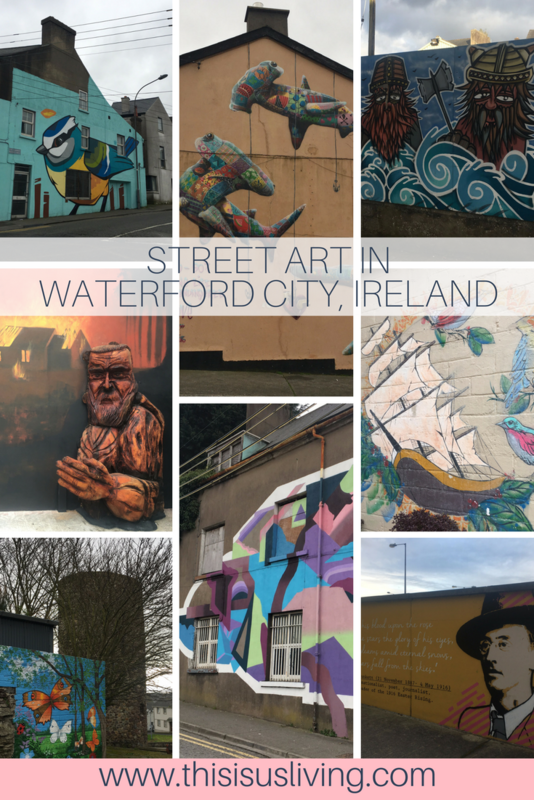 HAVE YOU VISITED WATERFORD? WHAT DID YOU ENJOY MOST ABOUT THIS CITY? 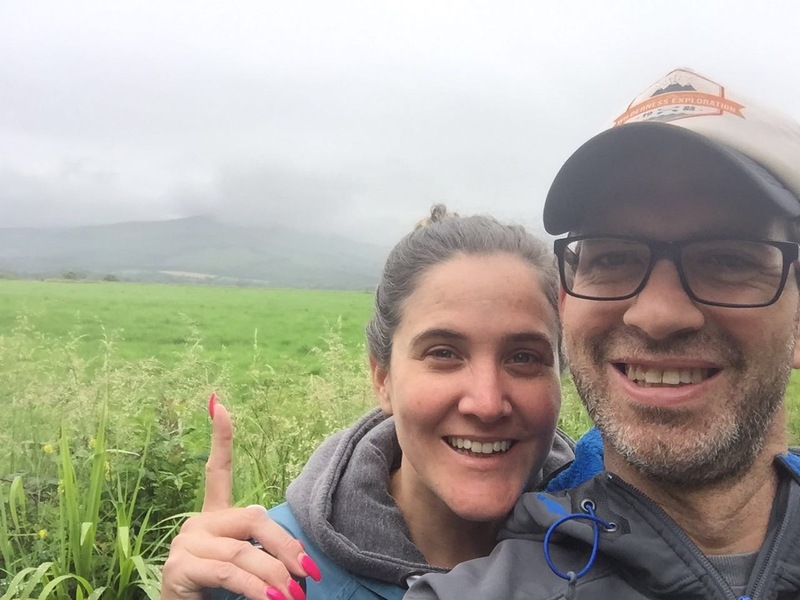 Rob and I recently were lucky enough to be invited to our first camping trip in Ireland. Our new friends invited us to tag along for their 40th Birthday celebration. As with most campers we have met – these guys love camping. But more than a love for camping, they are avid campers. What makes them so over qualified for camping is that they are mountaineers! They all met at university – and were part of the moutaineering club back in the day. So you could say that we were safely in the hands of experts in Ireland. So we like camping, and back home we had been slowly building up all the necessary camping equipment. Something Rob taught me very early on, the trick with enjoying camping is going away with the right gear. If you are kitted out enough – it makes the experience much more enjoyable. And he was right, even with our first experience getting off to a shaky start (we arrived at the campsite, at night, and had to pitch a tent that we were not familiar with – in the dark! ), I have loved all our camping trips together. What makes it so much fun is that I get to plan and organise to a point, but once we are all set up – then its pure relaxing, you can really step away from the hustle and bustle, and just be at one with the great outdoors (I realise this sounds super cheesy, but it is true). 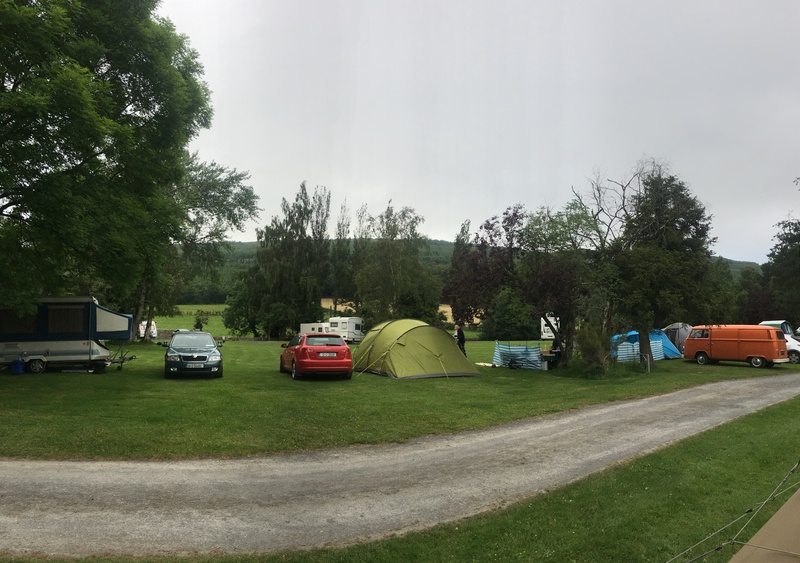 We camped at a spot just outside of Tipperary, on the way to Limerick, called Ballinacourty House. 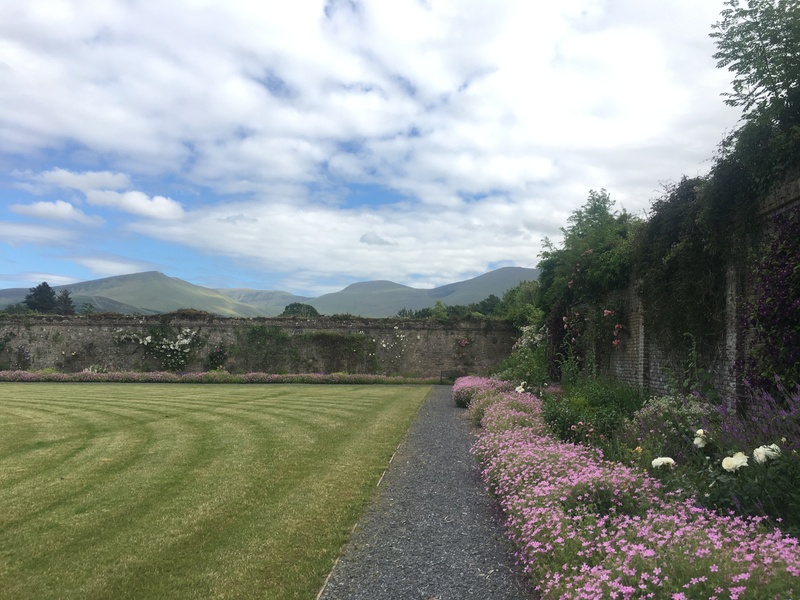 It was an absolutely stunning location, with a beautiful view of the Galtee Mountains. Also close to a great biking park where the guys went off to mountain bike the one afternoon. It cost us 9 euro a night to pitch a tent, per person (excluding electricity). 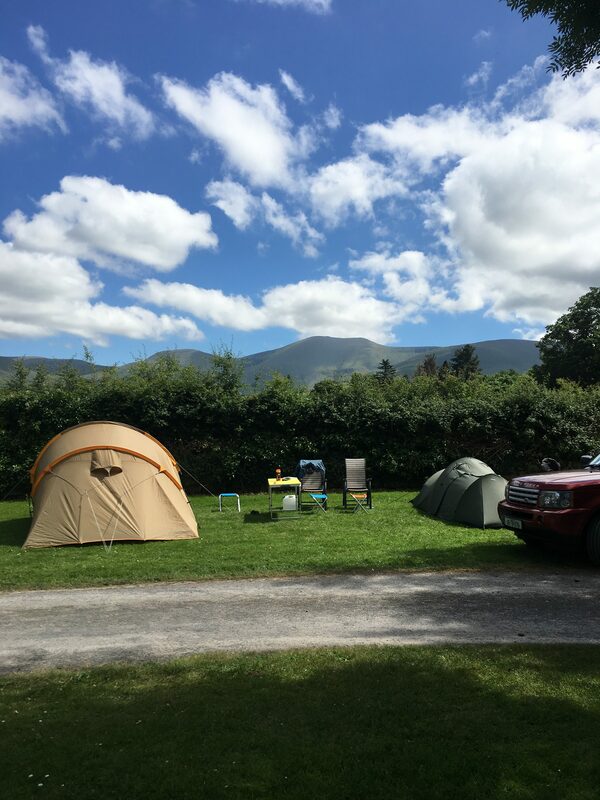 Camping in Ireland might be the way we explore more of this beautiful country, because under a tenner for a night is a huge cost saving in my books! Plus, this particular camping spot allows you to bring dogs! 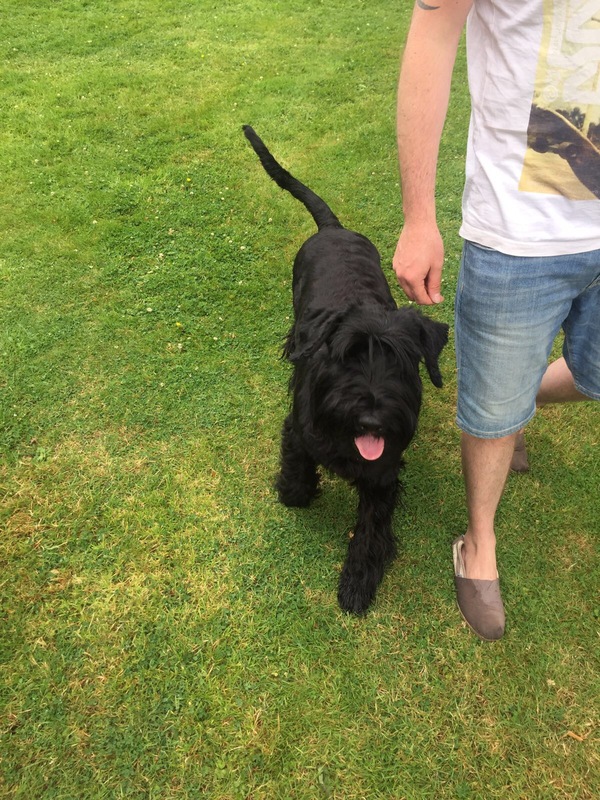 John and Ruth’s neighbours have the coolest giant schnauzer called Harper who got to come camping with all of us. On the camping grounds there is a walled garden with beautiful flowers, I took a million pictures of all the beautiful flowers – I definitely think it is a spot I would love to take Rob’s parents to, I know they would love it there! Harper! This picture really doesn’t show how big she is. 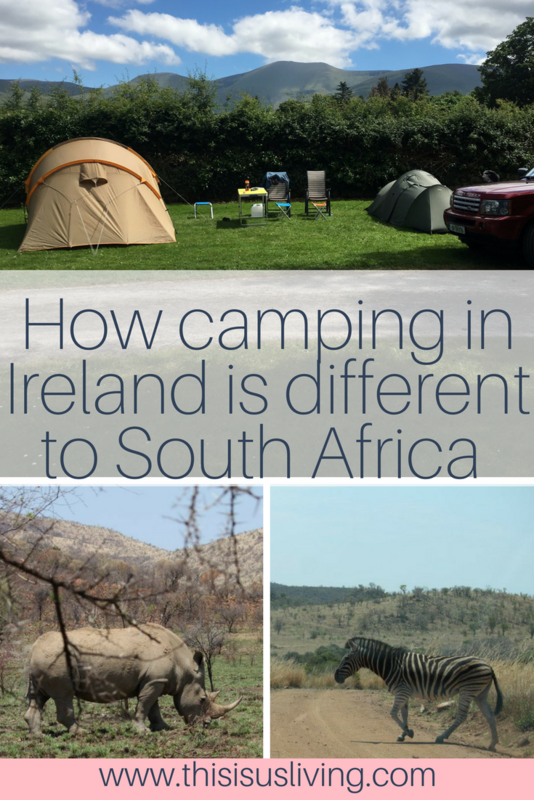 So what are the differences between camping in Ireland versus camping in South Africa? 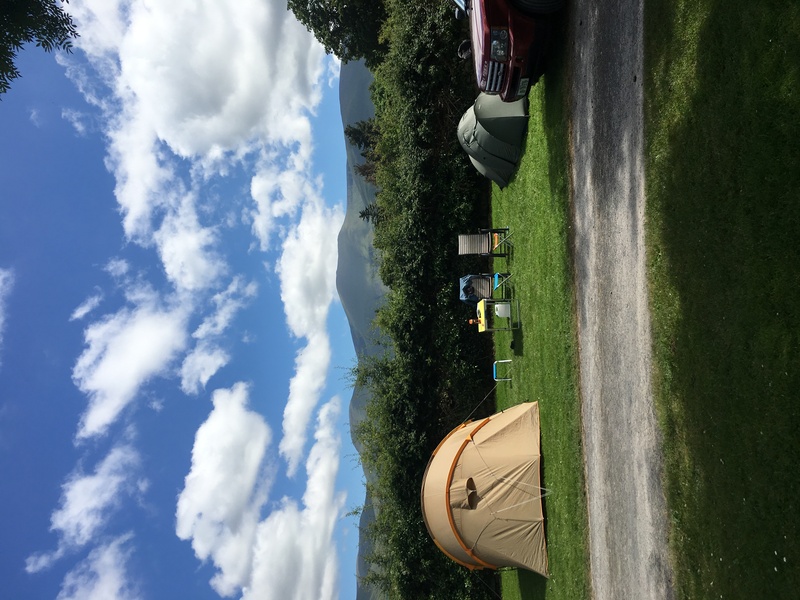 Pitching a tent in Ireland is a whole lot easier. (and that is not because someone did it for us). 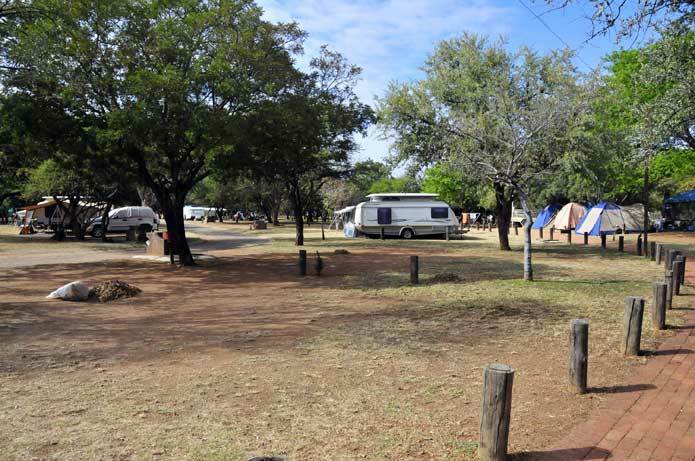 The ground is so soft that the pegs just sink into the ground – in South Africa one of the key camping essentials is a big hammer to hammer the pegs into the dry, arid ground. Not every camp spot has their own BBQ facilities. Every campsite in South Africa has braai (BBQ) facilities next to every tent! In Ireland, you have to bring your own, or in some cases, there are communal facilities that you share with the other campers. Recycling depots. I love that all throughout Ireland there are facilities you can use that help you to recycle. It is not so big back home, and I have never seen collection points for plastic, bottles and general waste all separated at an actual campsite until we were in Ireland. Plan for all weather types in one day. In Ireland it can honestly be all four seasons in one hour. On our camping trip we had a bit of everything. It was cold at night (I did not pack enough warm clothes! 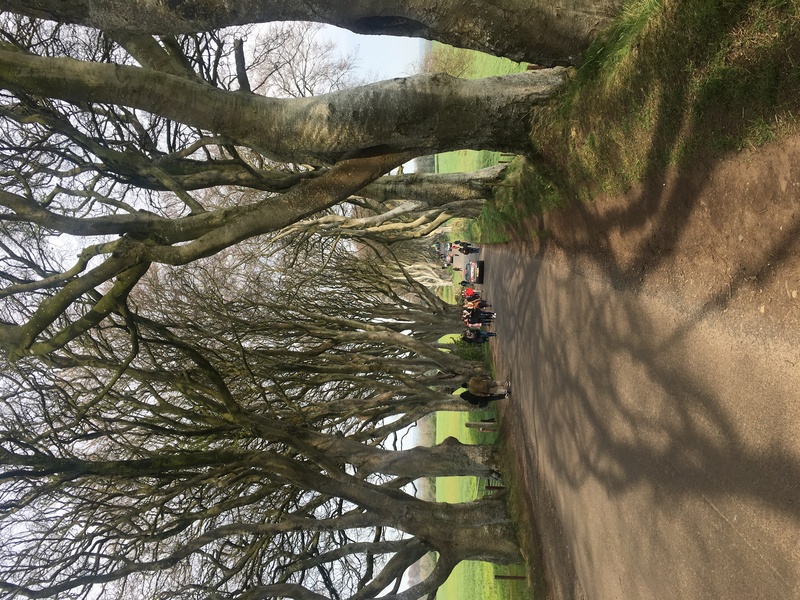 ), was misty in the mornings, and then it cleared up and was such a beautiful sunny day (I even got sun-burnt on my feet, because it was the first time wearing sandals in Ireland!). So bring sunblock, plus a thick coat. It is kind of weird that even though it rained, it didn’t ruin the camping experience. Back in South Africa, if you went camping and it started to rain, you would probably pack up and go home early. But I will say the rain here in Ireland is not like back home. It is more of a light drizzle, and you hardly experience thunderstorms, so it is not all together too bad. Midgies versus Miggies – it is important that you know the difference. In South Africa we have these pesty bugs that fly around in a group, just annoying you. They will fly into your face, and just generally buzz about. Those are called Miggies. Midgies are something we have only encountered in Ireland. These little buggers are lethal. They are like a cruel mix of a mosquito and a red ant. When they attack, you know it. But they are very tricky to really spot, they look like miggies, but they bite, so that means they are far the worst. We tried several midgie sprays, plus wore thick layers and covered up – and still got attacked. 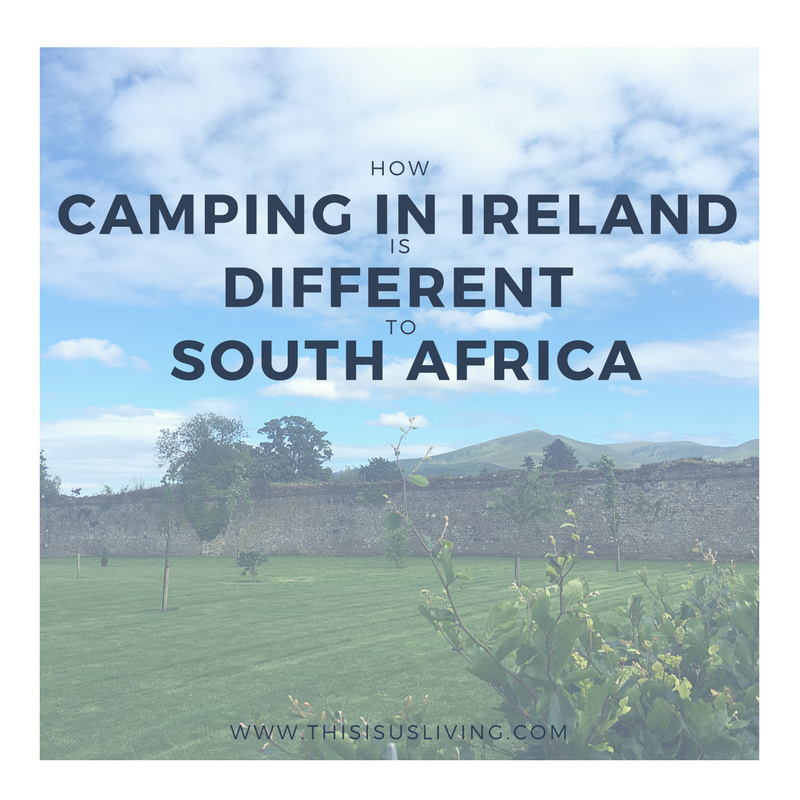 I have to say that we love camping – whether it is in Ireland or in South Africa. It is great to be outside, and away from the city. It was just the kind of mini-break we needed. A huge thanks to our new friends, John and Ruth, for making such a big effort to make our very first camping trip in Ireland a memorable one. We know that there will be more camping trips in our future, and we hope that one day, we can pay it forward and help someone out just like they helped us. Do you like camping? Where is your favourite place to camp? The great thing about travelling in Ireland is that it is easy to travel around the country. In fact, it only takes 2 hours to get from Dublin to Belfast. So with a 2 hour drive, you are technically in another country, even if you never leave the island of Ireland. The problem comes in when you don’t own a car. Some of the best spots along the coastline, are not easily accessible if you don’t have wheels to get there. While I am not against hiking, or walking, sometimes it is just easier to drive to your destination. It also means that you can see more than one place in a day. 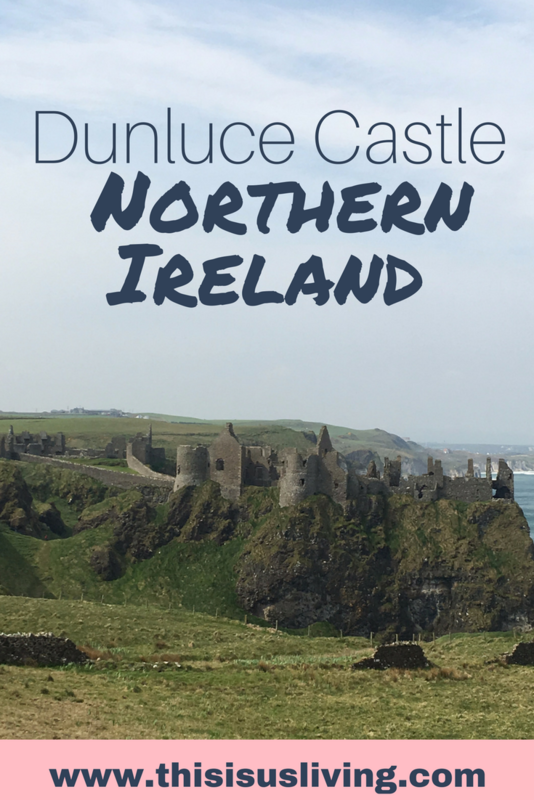 We found a great Groupon deal to take a bus tour up to Northern Ireland from Dublin. 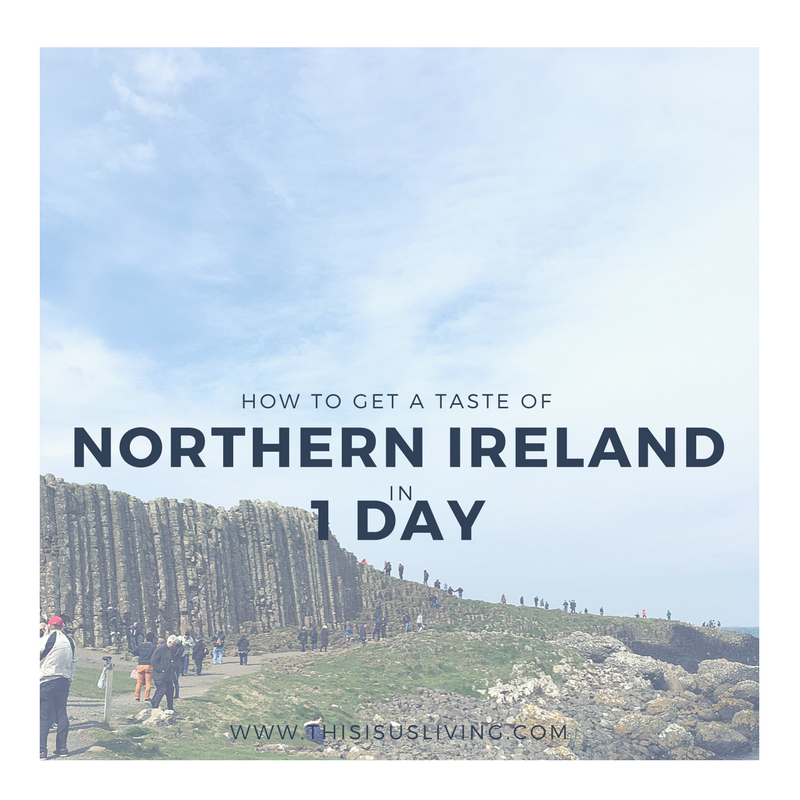 In one day, you get to stop at several stops, learn a bit of Irish history and see beautiful coastlines as you sit comfortably in a bus. I wasn’t sure if we were going to enjoy the bus trip. As you all know, we are not conventional tourist type, in fact, I make it my mission to avoid crowds and tourist traps wherever we go. 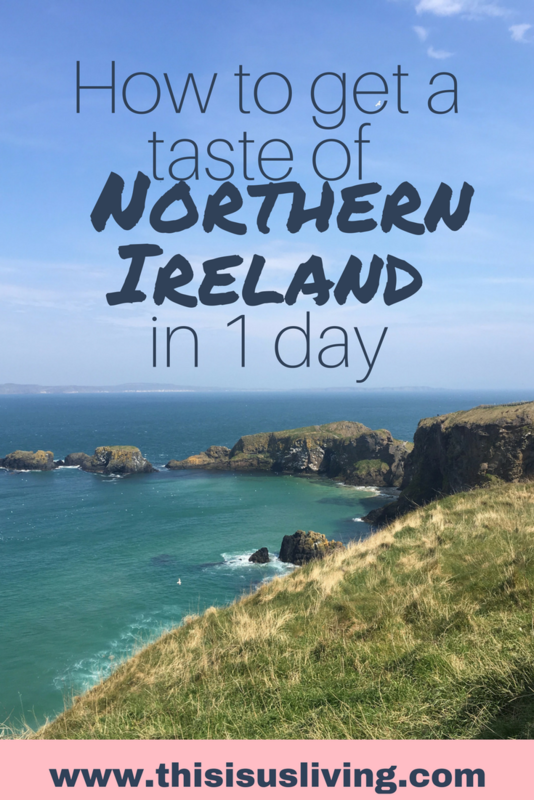 But this day trip was a great way to get out town over the long weekend – and get a taste for Northern Ireland. At best I thought we would snap a few pics, and have a fun day out. 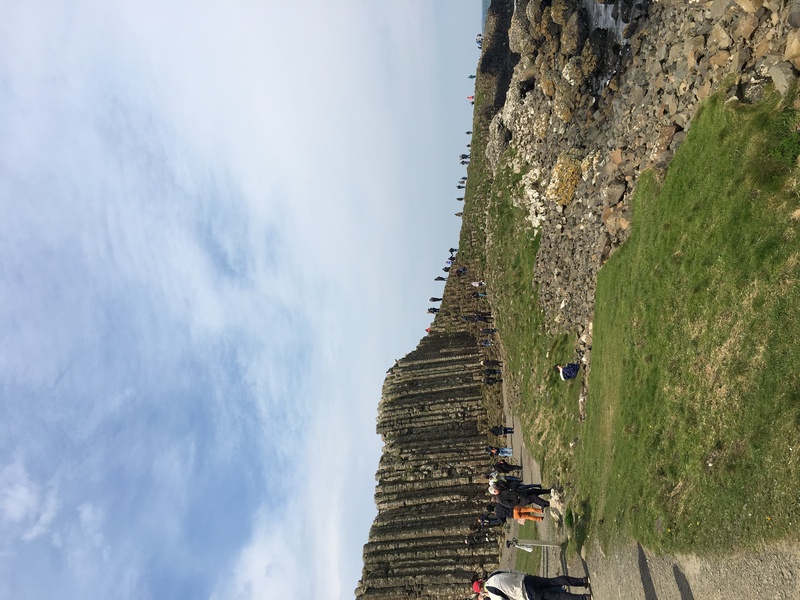 I have to say that the tour guide we had on the bus was super informative, she made it feel like she wasn’t just reading a script – she cracked a few jokes, told us some interesting facts, and pointed out things we would have missed had we driven there by ourselves. 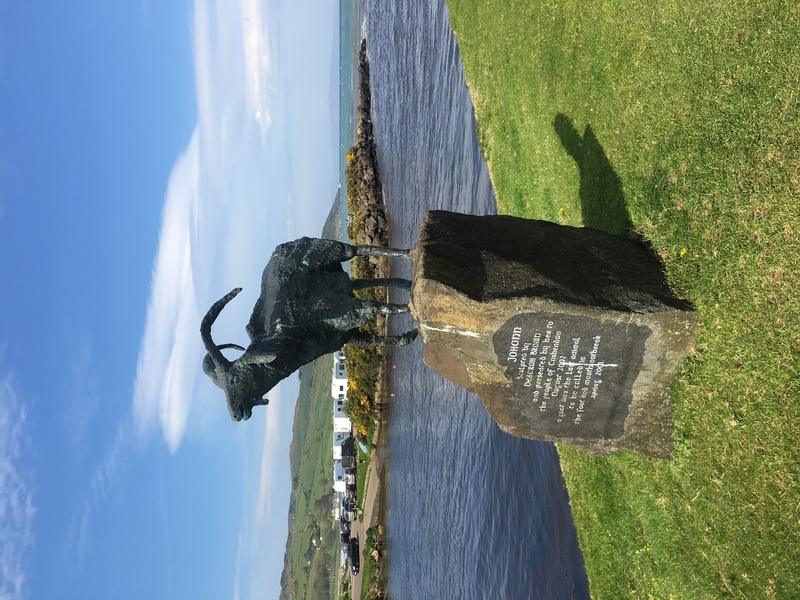 All in all, I have to say that if you are looking to see parts of Ireland that require a car, then taking a bus tour should be your first choice – and I highly recommend taking Finn McCools bus tour – since it is affordable and well worth it (also out for Groupon deals to make even more budget friendly!). The day starts out quite early. We had to be at the pick up spot at 6:45am. Because it was too early to take public transport, we walked to a bike station, rented bikes and cycled up to the pick up spot just off O’Connell street. The bus left on time, and we headed out of the city on the motorway. They stop at a petrol station just outside Northern Ireland, as a last chance to buy any snacks or beverages for the day. *Tip: Rob and I made sandwiches and packed a picnic of snacks we brought from home. Bringing your own will save you money, as buying snacks at the petrol station, or at the tourists spots is bound to be overpriced. The first official stop is in Belfast City. 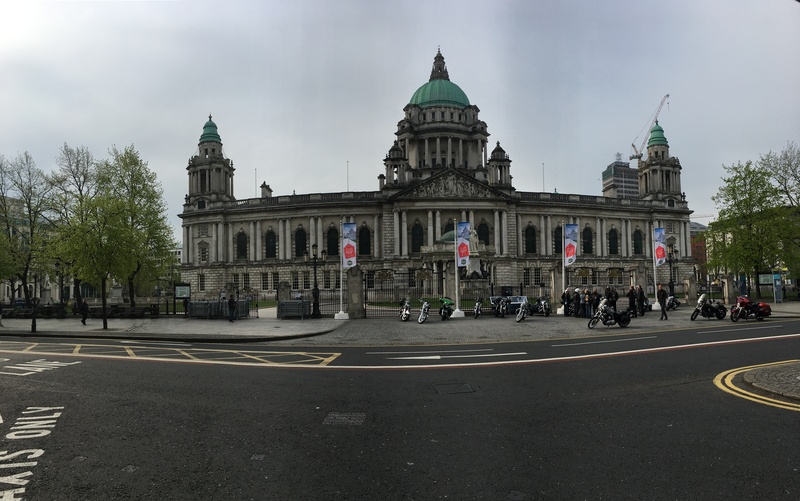 We arrived in Belfast at 9am, on a Sunday, which meant it was pretty quiet. Most of the shops only open at 1pm on a Sunday! You get a little over an hour to walk around. The nice part was that it was quiet, so we got to take pics, without tons of crowds. We took the time to draw some money, and walked around city hall. 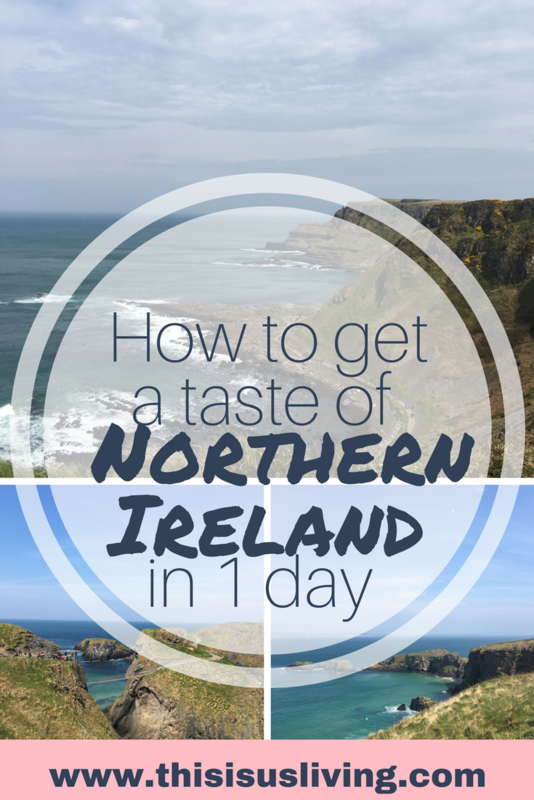 *Tip: Keep in mind that Northern Ireland does not work in EURO’s, so you would need to have pounds to spend at any of the stops. This stop is also the only chance you get to draw some pounds, which you could need if you want to do any of the add-ons during the trip. 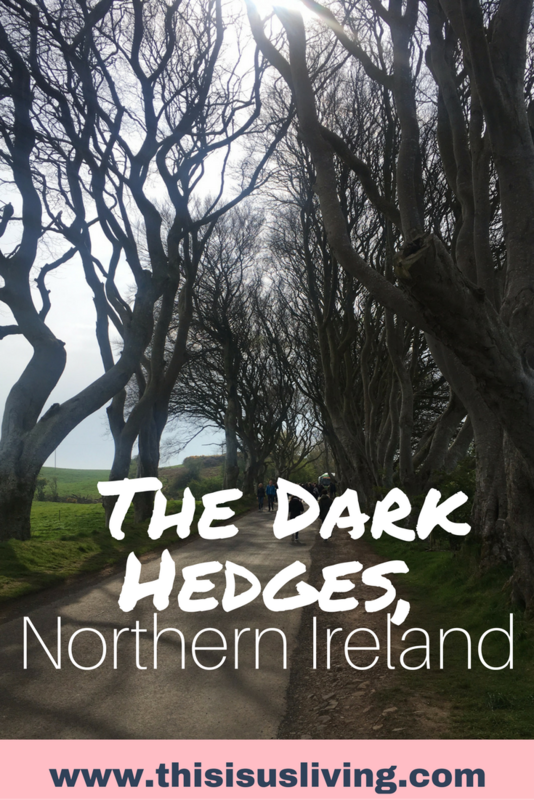 The next stop is at the Dark Hedges. This is one for the Game of Thrones fans. 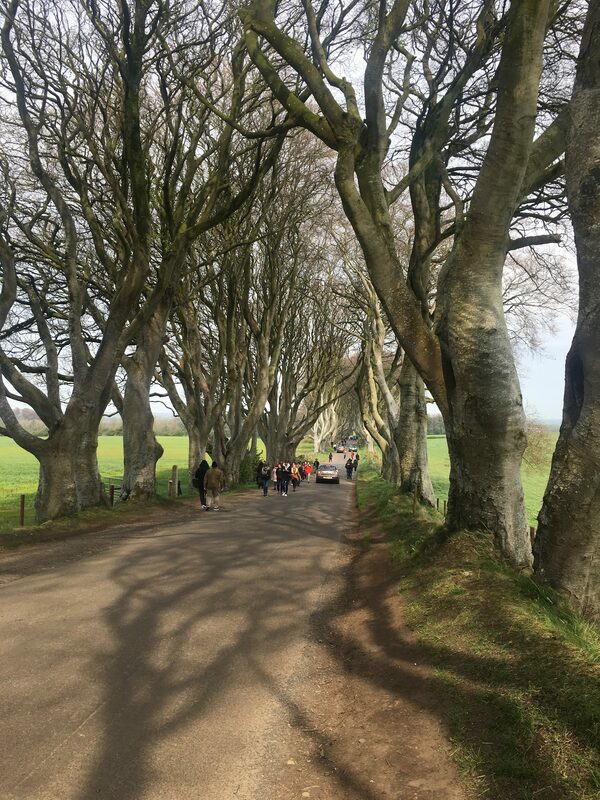 It is a strip of road that has these unique trees on either side. It was used in a scene in GoT, but obviously looks a bit different without all the special effects. To be honest this stop is overcrowded, there are people and cars/buses trying to access this road (as it is not cut off from the public, people still try use this road to drive through), so it is difficult to get a “perfect” pic. Tip: You only get 10 minutes or so, so get out the bus quick and try get ahead of the crowd to take a pic before it gets too crowded. 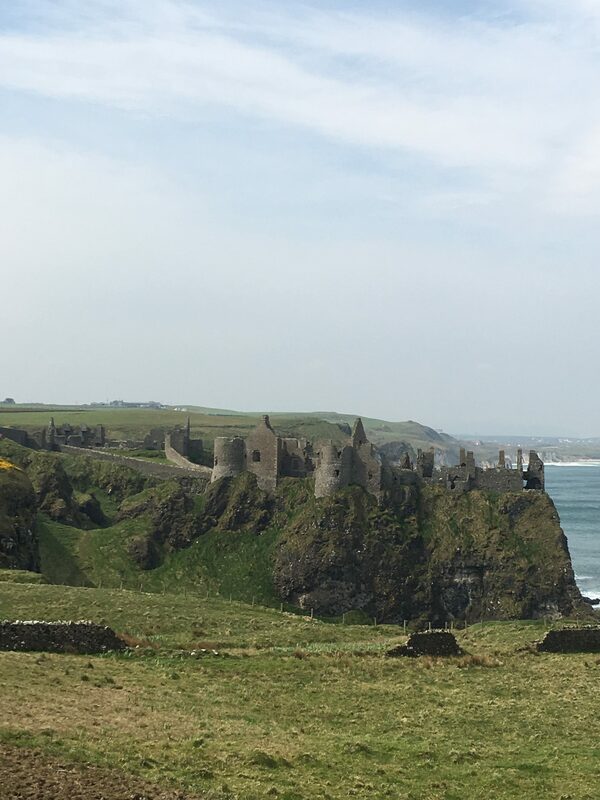 A quick stop to take a pic of Dunluce Castle is the next stop. It was pretty windy, and because the castle is a little farther away, my cellphone pic just didn’t do it justice. 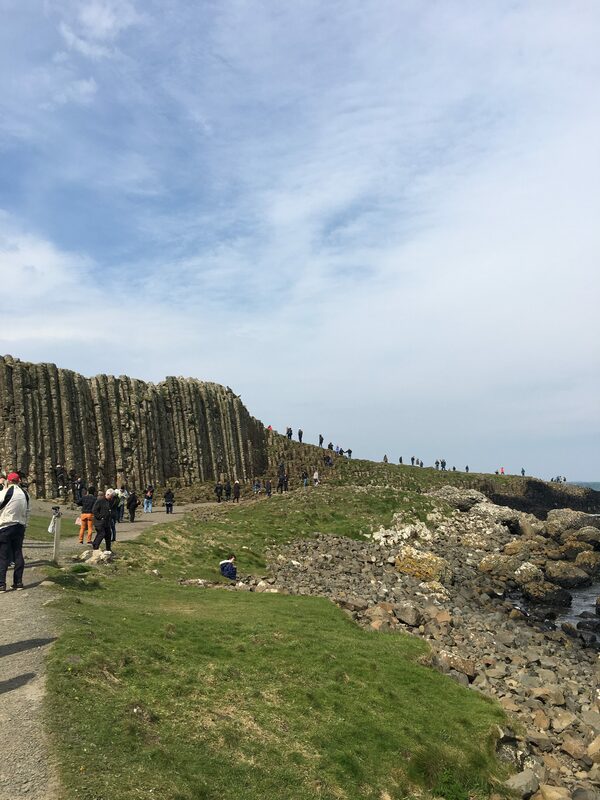 The main stop for the day is Giant’s Causeway. 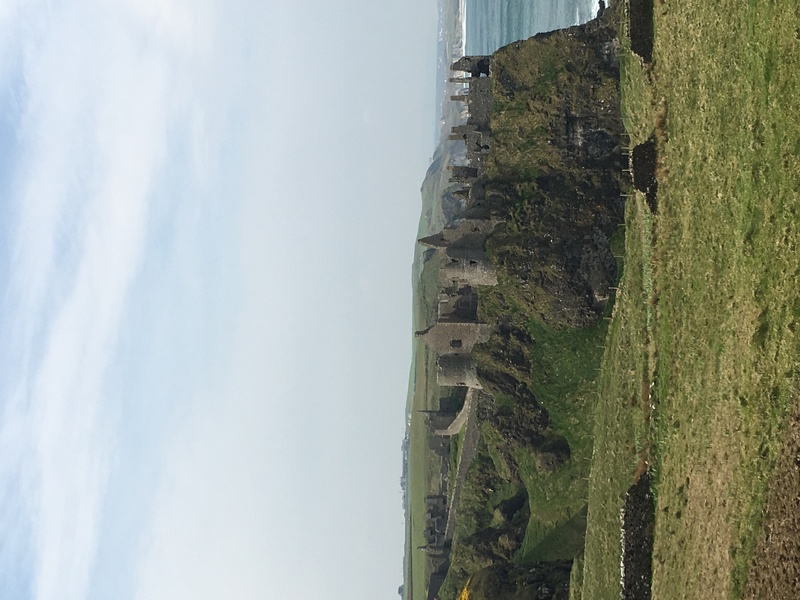 Our tour guide, Tara, gave us the “full Irish story” of this UNESCO world heritage site, and 8th wonder of the world as we were driving there. I won’t give too much away, but I will say that it involves a giant named Finn McCool. 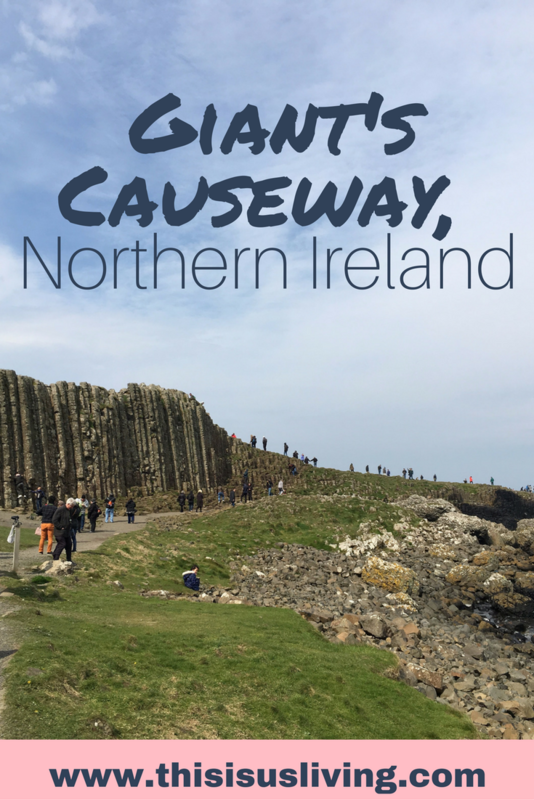 We stopped here for a good hour and half, and had our picnic lunch with a view of Giant’s Causeway. Tip: It is a unique spot, but I recommend if you have time to walk down towards it, and then loop back going up the stairs and walking along the cliffs. It gives you a nice view of the Causeway from above. 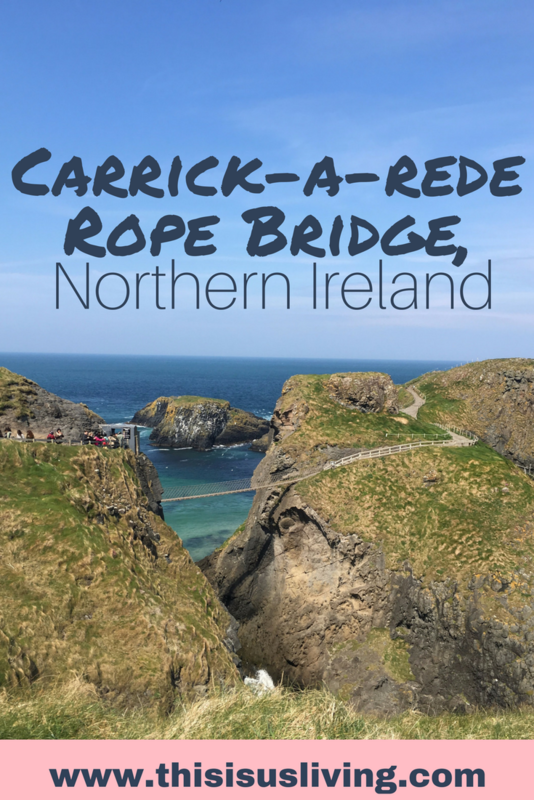 The next stop is at the Carrick-a-rede Rope Bridge. You have a little over an hour to explore, and if you would like, you can walk across the rope bridge for £7. Unfortunately, the rope bridge was closed when we went, due to extremely high winds. 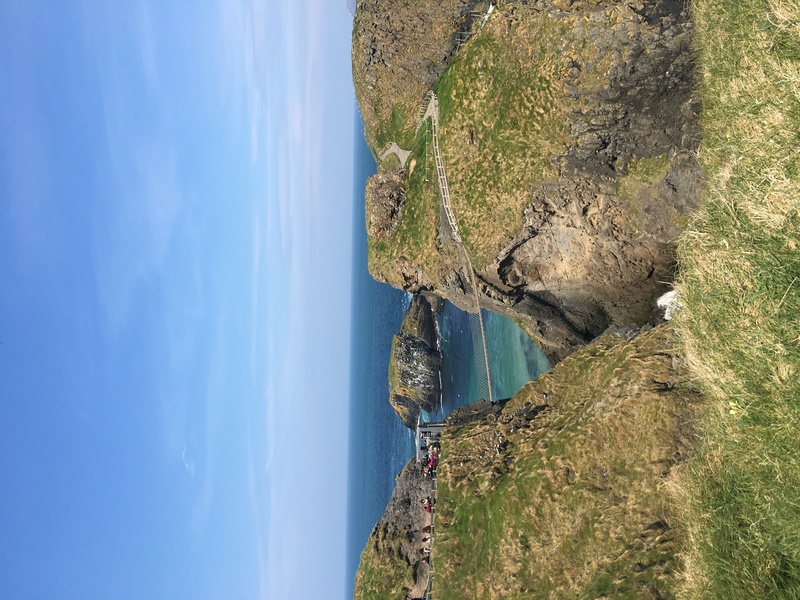 It is however, a beautiful stop – we walked along the cliffs on both sides of the car park, and really will have to go back to brave the rope bridge! 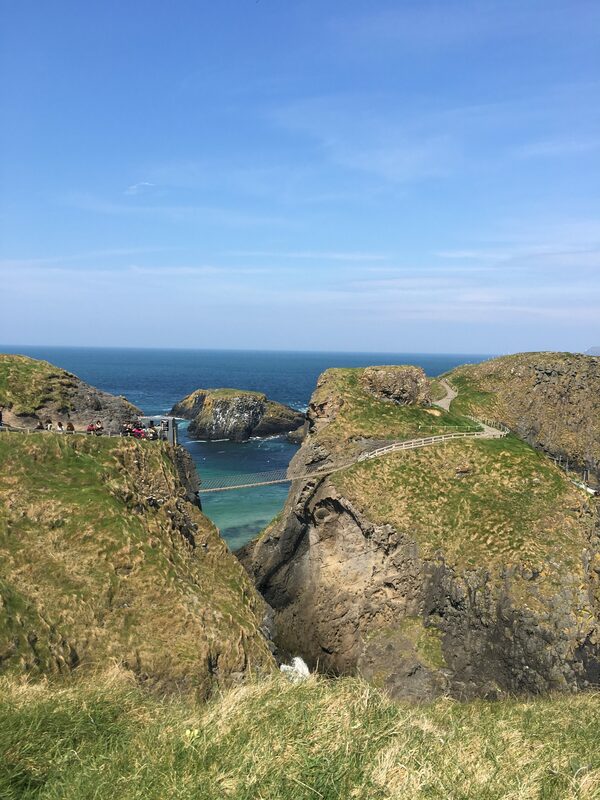 Tip: Finn McCool’s offers a discount if you buy your rope bridge ticket from the bus driver – but you need to pay in cash, and they only accept pounds! 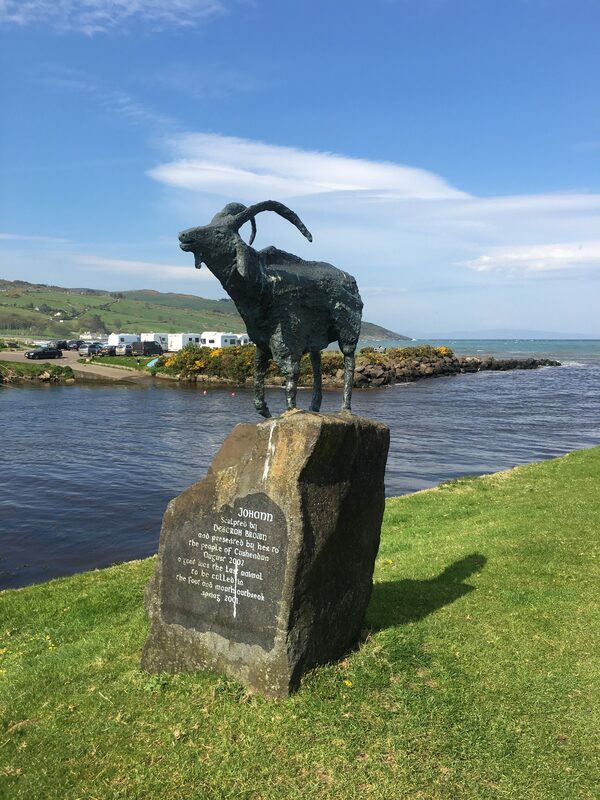 From here, we drove to Cushendun, and did a quick stop here to see another famous GoT scene, as well as Ireland’s most famous goat! On a clear day, you can get sight of Scotland, but we didn’t get to see it on the day we went. Still, it is a quaint little village, with beautiful views. On the way, back to our last stop, our tour bus had to detour due to a car crash that diverted traffic. In usual circumstances, you would expect the bus driver and tour guide to get a bit flustered, however this did not slow them down one bit. They cracked a few jokes about getting us lost in the Glens, and we ended up seeing a bit more than we thought we would. Even with the detour we still got home in time, and I loved how well it was handled. The last stop is back in Belfast. This time we managed to walk down a few side allies and find some great street art while we were there. 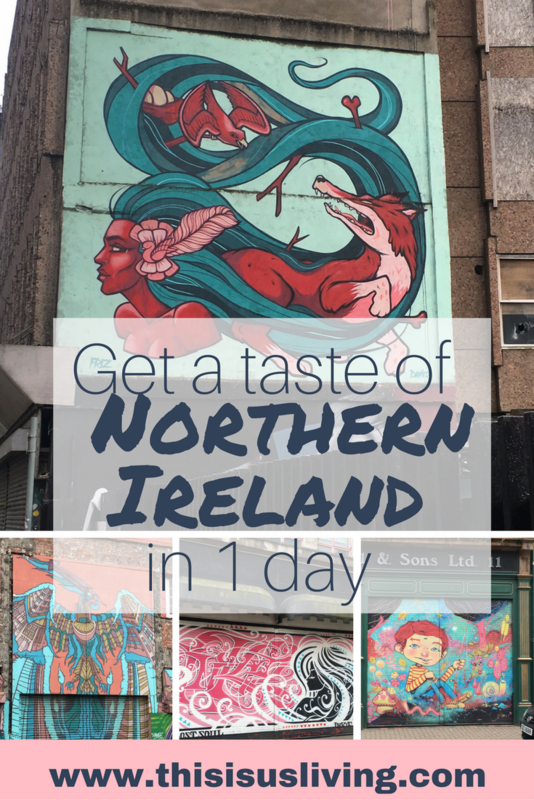 I definitely think it gives you a nice flavour for the city, but not nearly enough time to properly explore Belfast – so we are keen to head back and really stay a few days. I see that Finn McCools have added a new tour that gives you more time to explore Belfast, so perhaps that may be a good option for us too. Let me know in the comments: Have you done a bus tour? How did you find it? 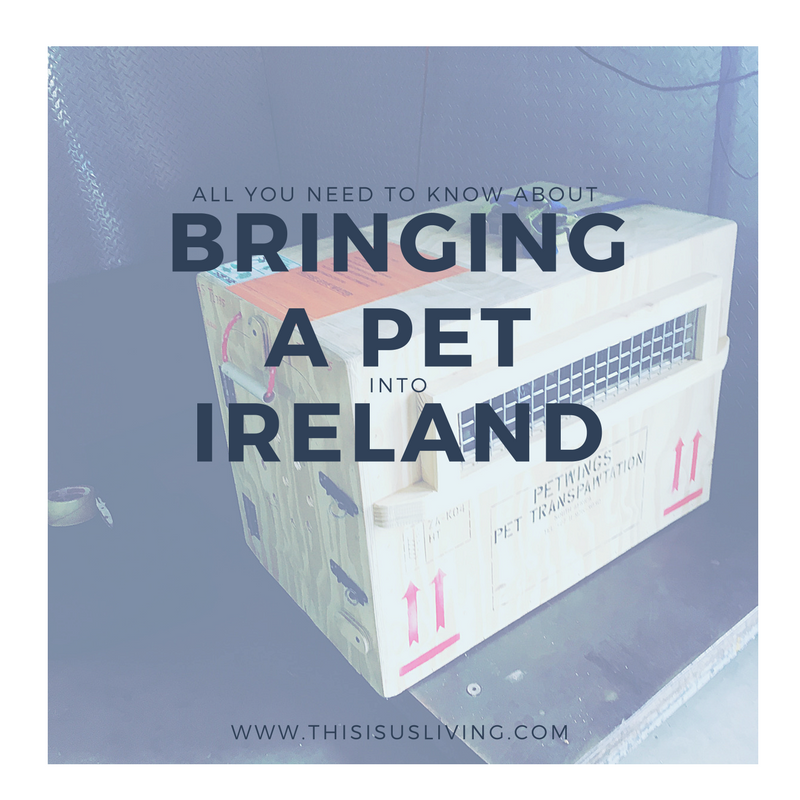 When we decided we were keen to move to Ireland, we first looked at how our furbaby was going to get over there. You see, we might not have any human babies but we do have Jack, and well, he is our baby. Jack is part of our little wolf-pack, and so he definitely was coming over – no matter what. We spoke to our vet before deciding to send Jack over and decided against giving him any drugs while he flew. 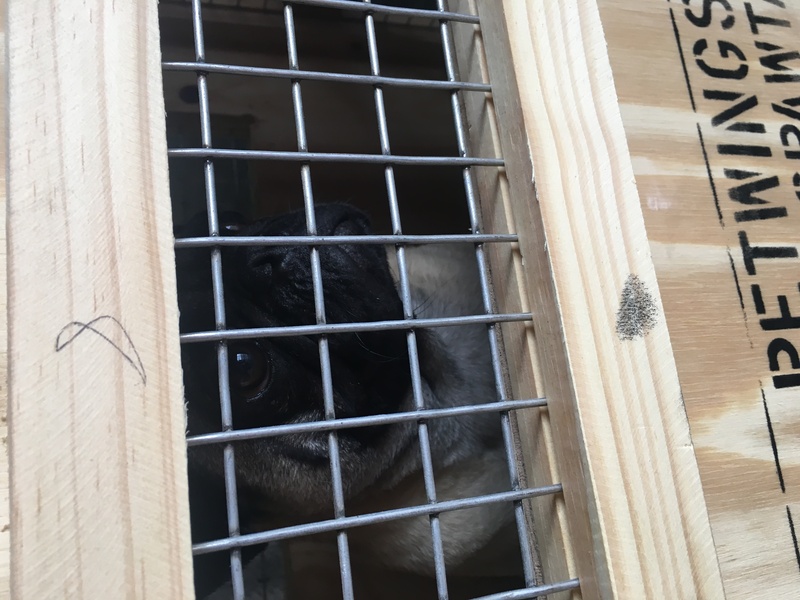 We wanted him to be able to wake himself up and breathe easily – as these are concerns some Pugs have. Our vet also said that you should take into account your pet’s age. Jack was turning 3 at the time, so he was still young enough to travel. Our vet said that pets over the age of 8 or so, or pets that have ailments, it makes travelling with them a bit more tricky. Allow 90 days for medical clearance. 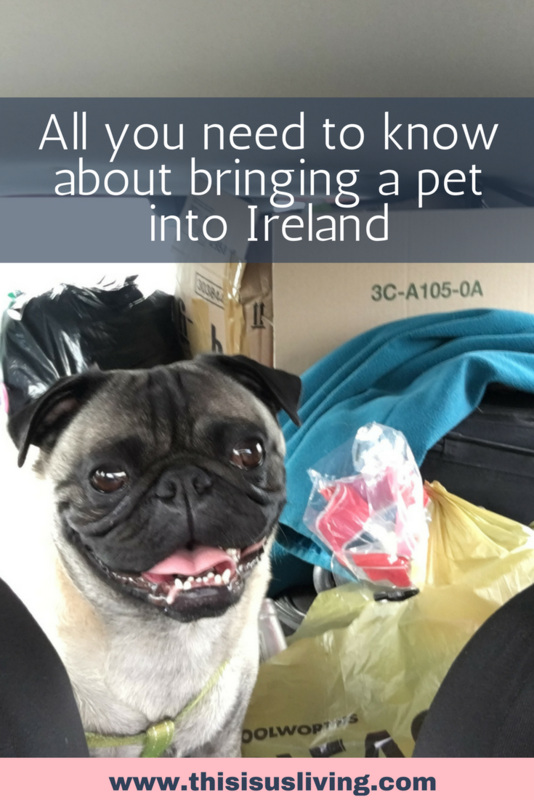 In order to obtain access into Ireland, you need to take your pet to your local vet and get blood taken to check that they are up to date with their vaccinations (most importantly, the rabies vaccination). Ireland doesn’t have a problem with Rabies, in fact, your pet won’t need this vaccination whilst he lives in Ireland. So they are extra careful that any pet coming over to Ireland is fully vaccinated against Rabies. The trick with this blood work is waiting for the results. It cost us around R2000 to get the bloods taken and sent off. 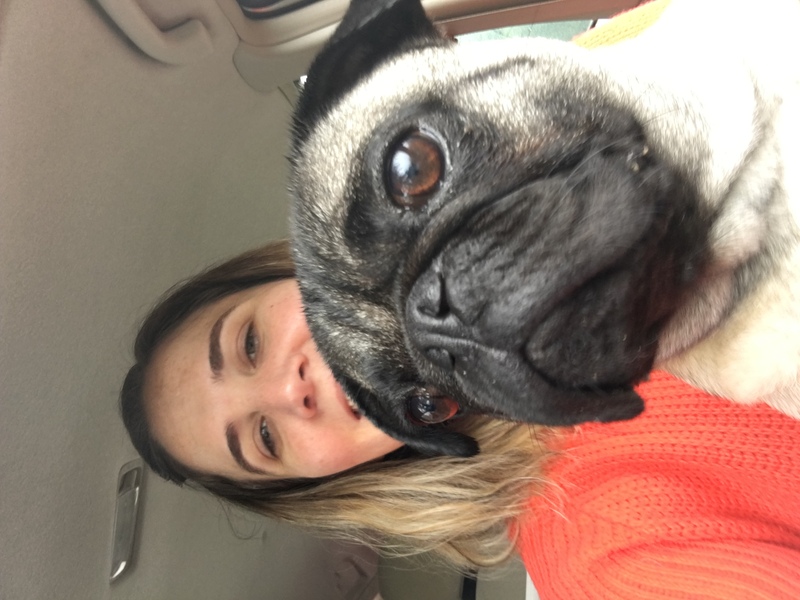 Your vet sends it off to a lab (In South Africa it goes to Onderstepoort), then you wait to receive the certificate that your pet is cleared to travel. When we sent off the bloods, Onderstepoort had been on a strike and was backlogged by one month. It took 2 months to get the certificate. *Important: You need the original that gets sent to your vet. From the day that the blood is taken, you have to wait 90 days before you can travel. This was a bit confusing for us, and the reason I ended up having to wait 3 weeks after Rob left to be able to send Jack and myself over (Also, it is 90 days, not 3 months). Your pet needs to arrive within 5 days of yourself. Either five days before or after you arrive. Any longer and it could be seen as you are trying to import a dog that is not your own. The problem when you are moving countries, you might not have a place set up yet. 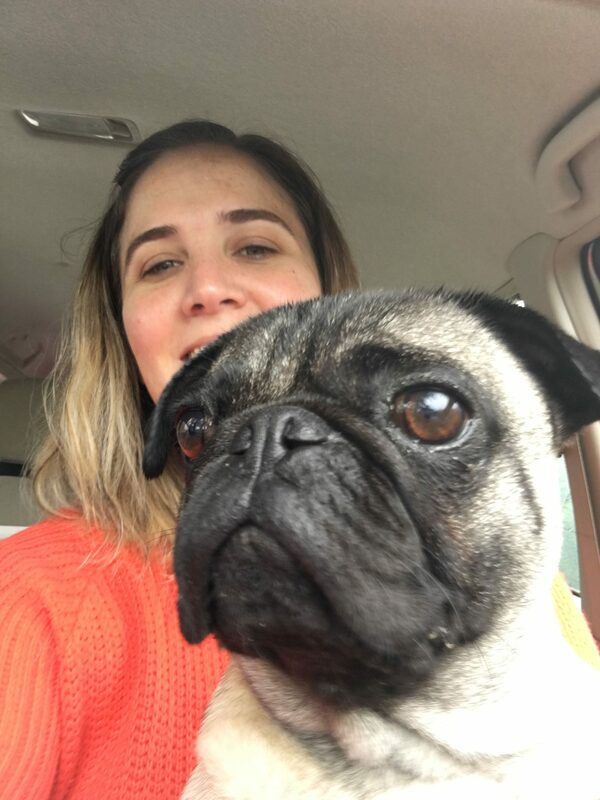 Although we had friends who paid for kenneling here in Ireland while they searched for a home, we didn’t want to put any unnecessary stress on Jack (so we made it kind of stressful for ourselves instead!). Rob flew over first and found a place for us to stay – then Jack and I flew over a day apart (I arrived before he did). If you can afford it, use a professional. Although I am sure you can fly your pet over on your own, the hassle and stress of making sure you have all the right paper work is just not worth it in my opinion. We used Keringa Pet Wings (friend’s used them prior to us). I have to say, they were incredibly patient and understanding with all my questions and concerns. You simply fill in a form online and they will send you a quote to fly your pet overseas. 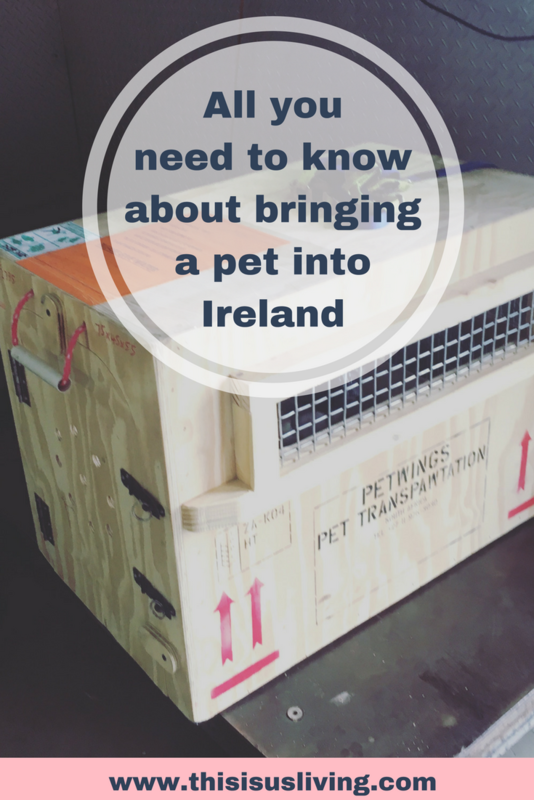 The quote includes costs for vet checks before he leaves (not the blood test), made-to-order crate for transporting, boarding while waiting for the international/connecting flight (we flew Jack from Durban to Johannesburg then onto Dublin – with a stopover in Frankfurt). You need to measure your pet and then they will make a crate that is the perfect size for them. 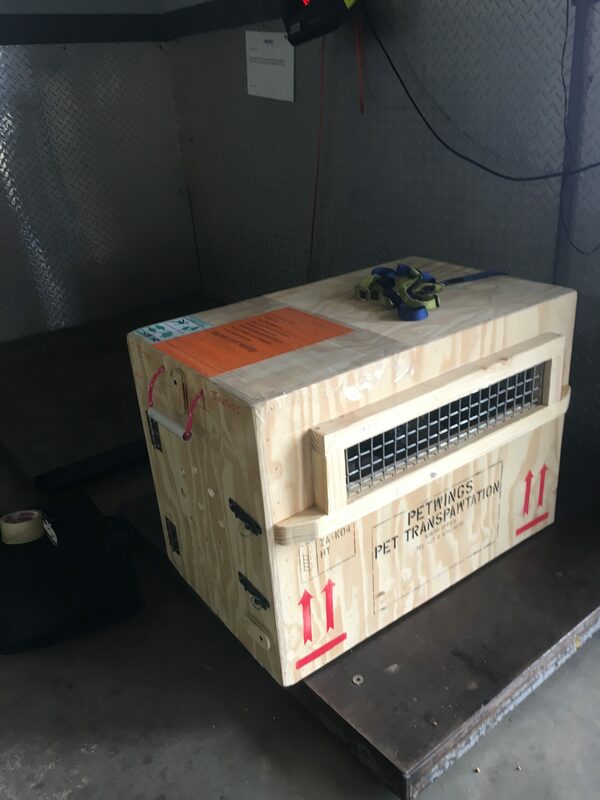 The costs vary based on when you send them over, stop overs and boarding, as well as crate size. We paid R18000 to send Jack over mid November 2016. I was super worried about this one. 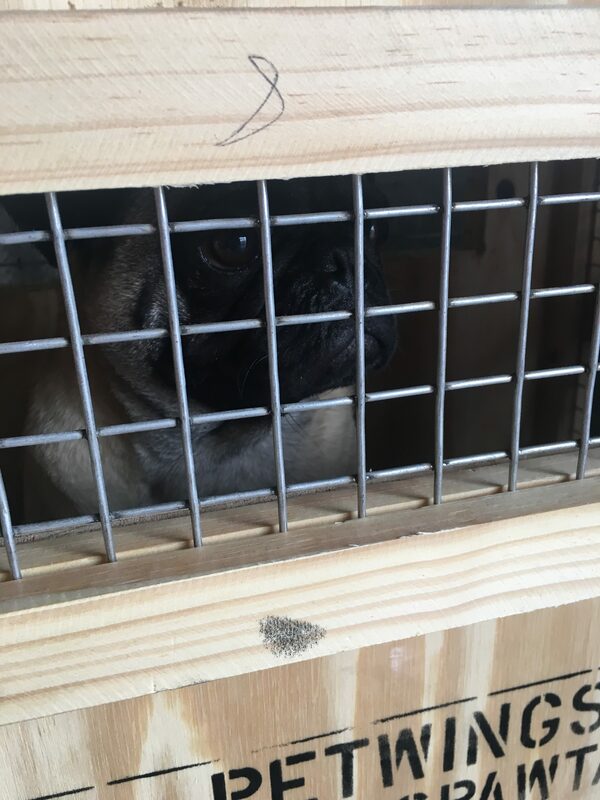 Jack had never flown before, nor had he ever been in a crate. This dog literally has a better life than most humans! He sleeps in our bed, under the duvet with his head on the pillow. I am convinced that if I don’t find a job, Rob and I would stop eating just so that Jack could keep eating his fancy, vet-approved meals. So I was super worried how the crate and flying would go. He loves travelling in a car (he loves the adventure and looking out the window), but honestly, he is happiest when he is with us. If we were ever thinking of moving back to South Africa, or anywhere in the world for that matter – I would highly recommend using Keringa Petwings (and no, I wasn’t paid to say that!). Even if you just want to ask a million questions, they have been in this business for over 20 years – ask them anything, they can offer you some great advice. I hope you found the tips informative, let me know if you have any other questions!